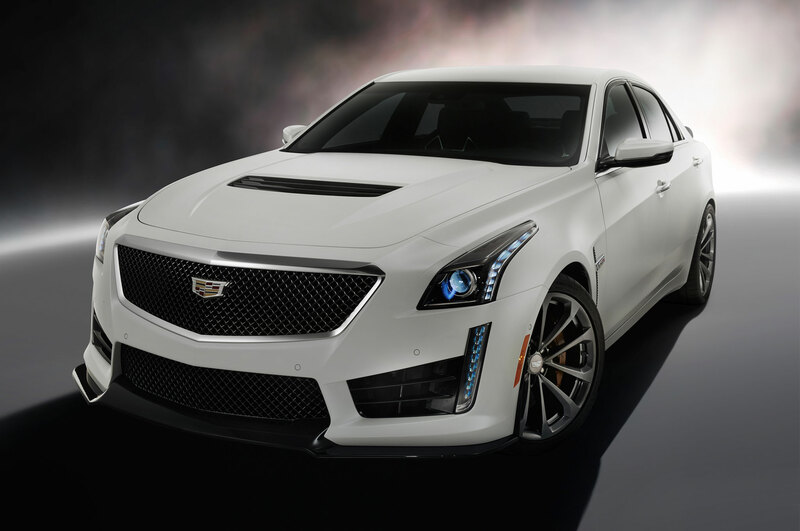 Latest hot-rod Caddy grows up and gets 640 hp. 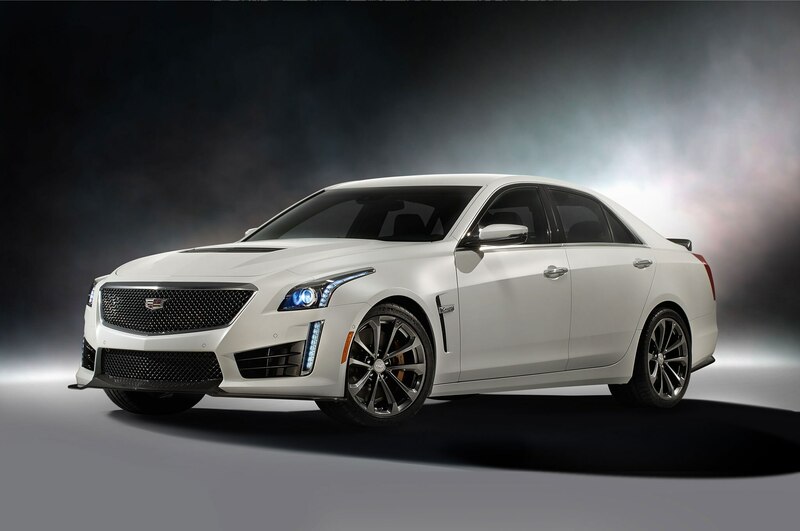 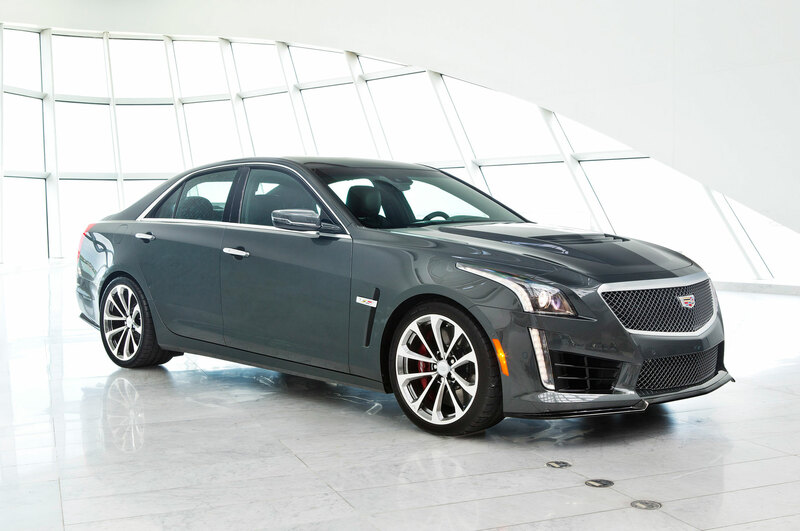 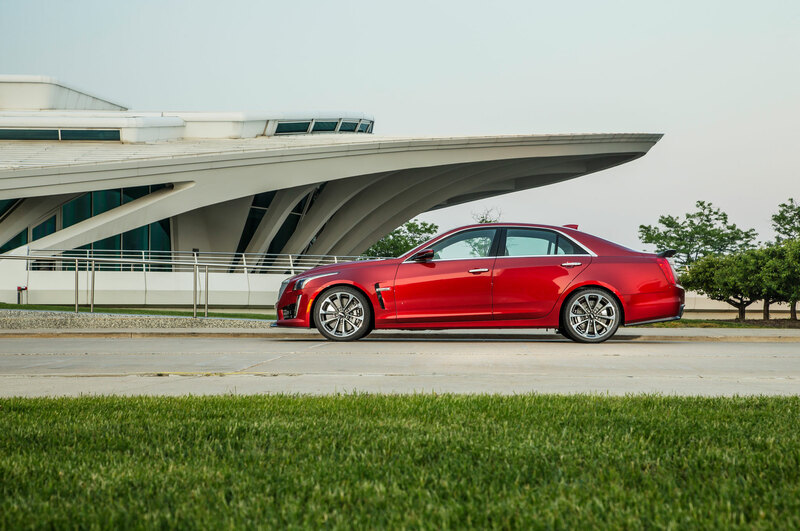 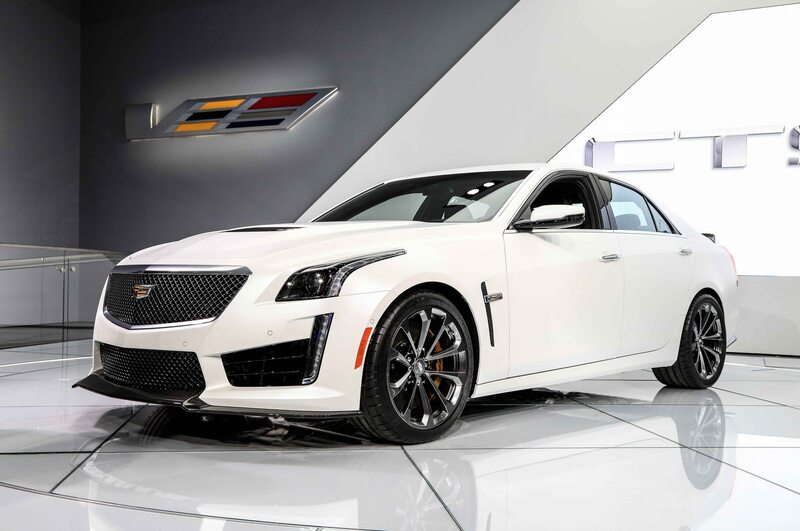 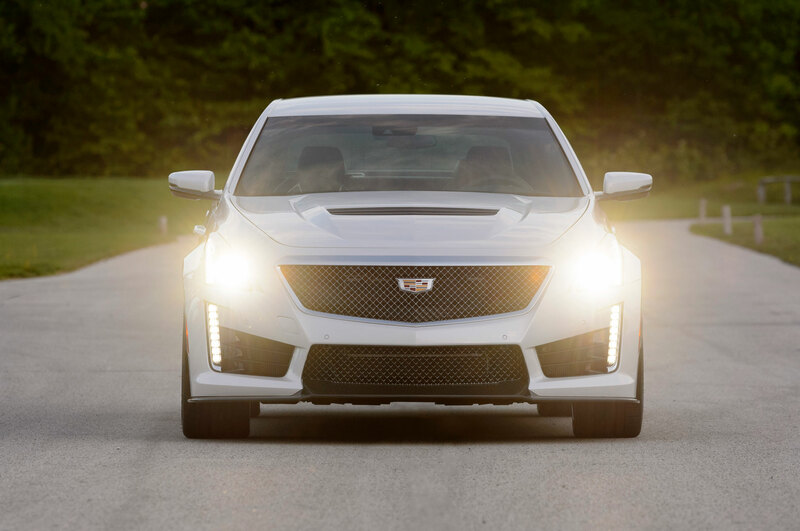 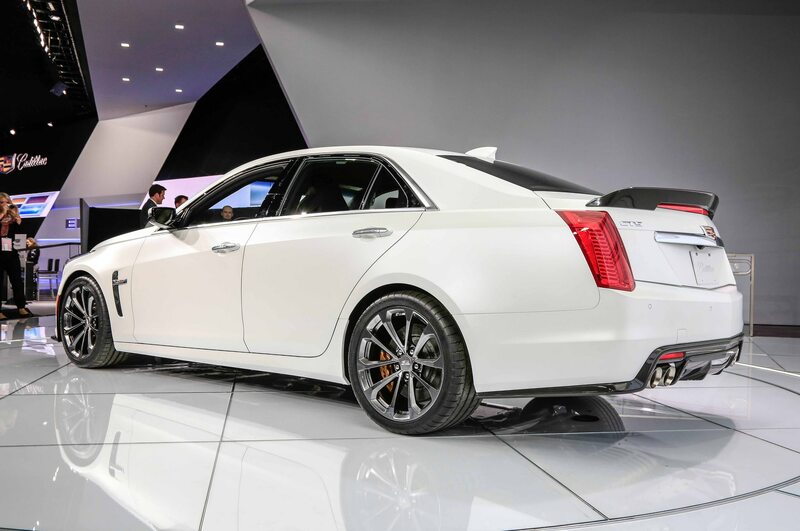 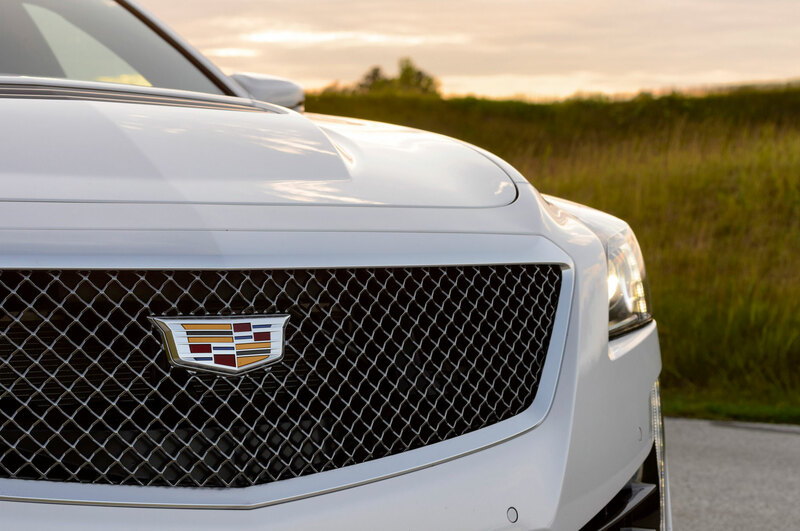 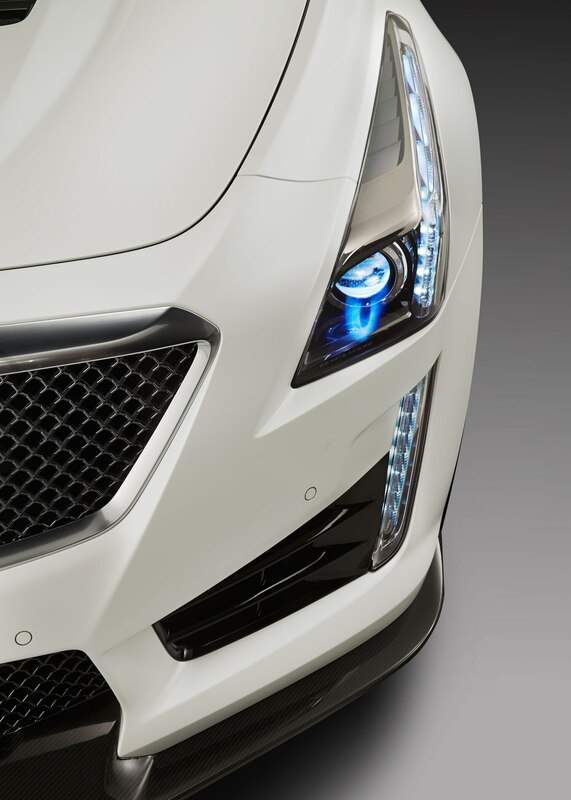 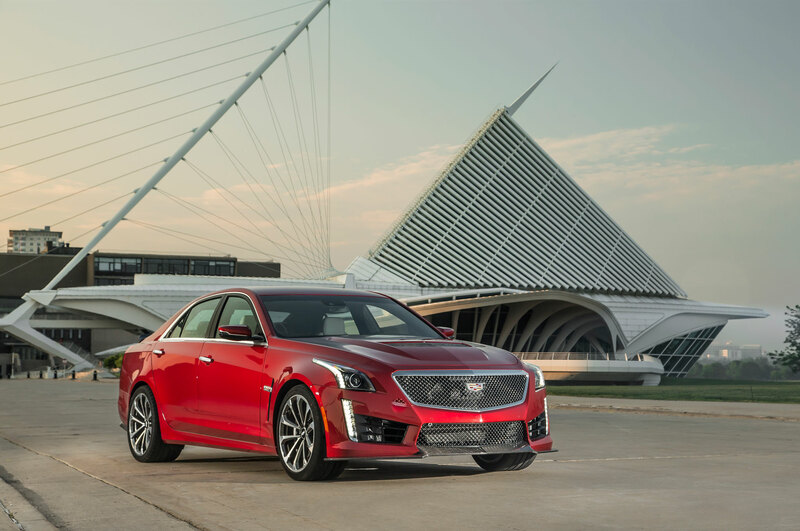 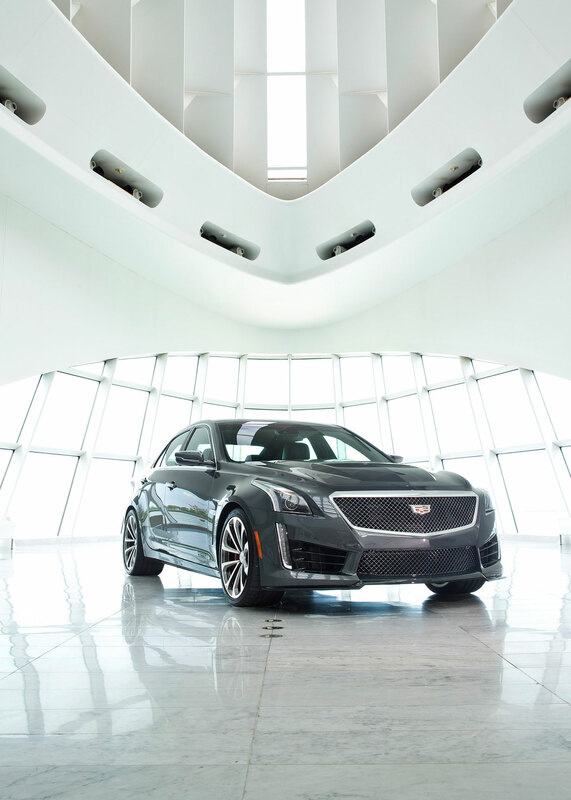 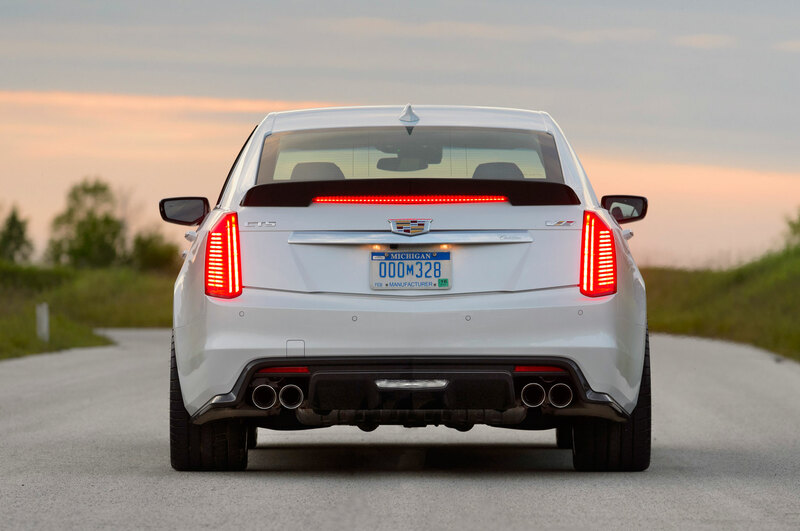 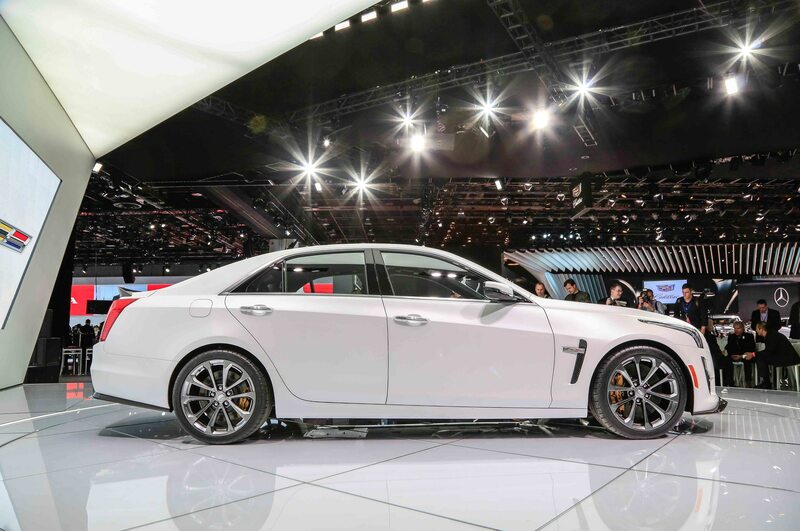 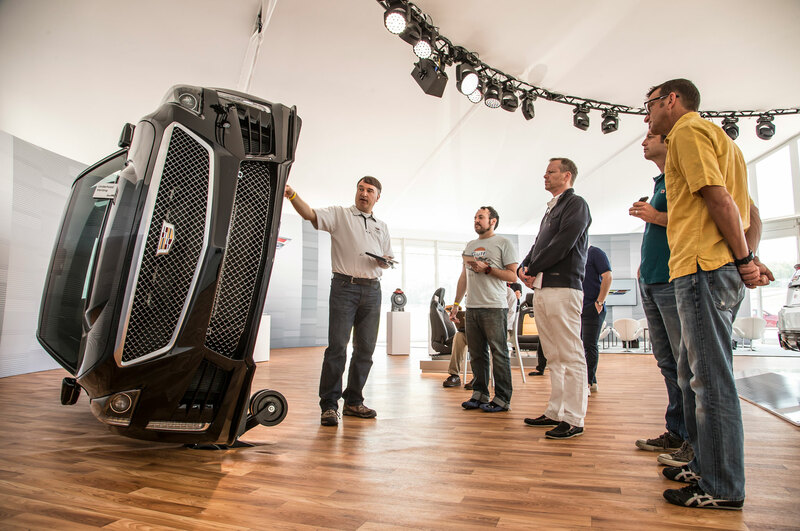 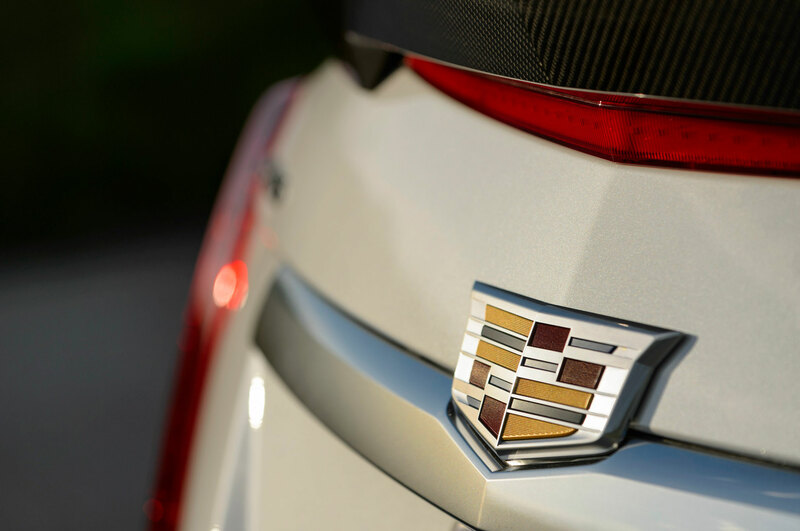 DETROIT – Cadillac’s third-generation 2016 Cadillac CTS-V, which is making its world debut at next month’s Detroit auto show, is a study in contrasts. 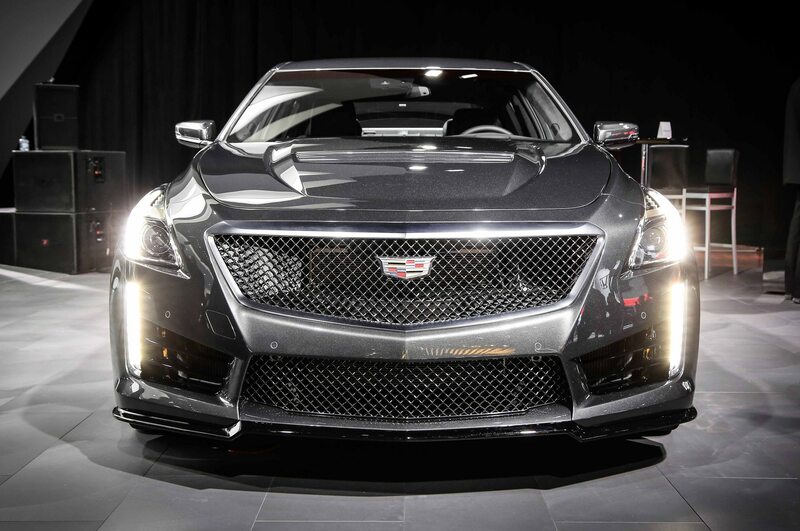 With more power and torque, more carbon fiber, more style and more stuff, the latest CTS-V is being prepped to do battle in a luxury supersport-sedan segment dominated by German rivals that long have balanced on the precipice between stealthy tastefulness and outrageous attitude. 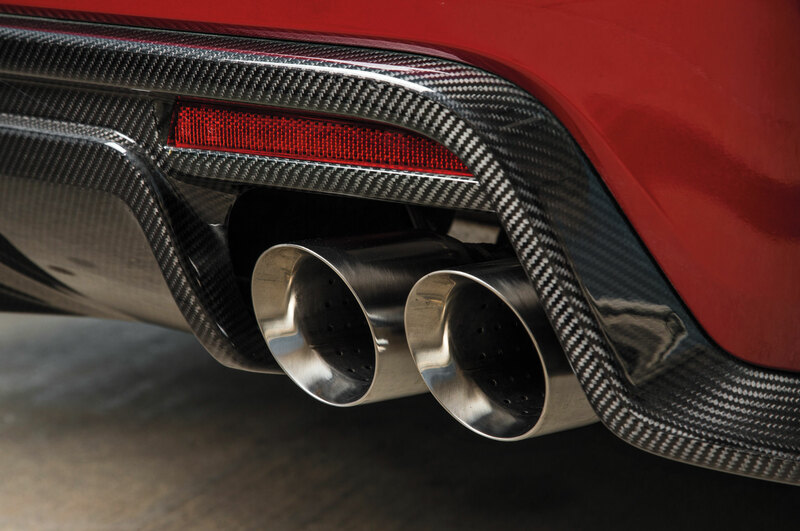 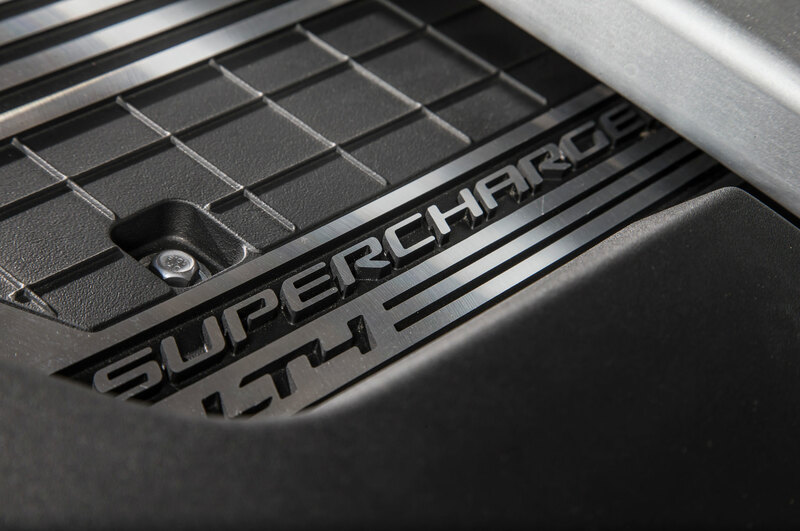 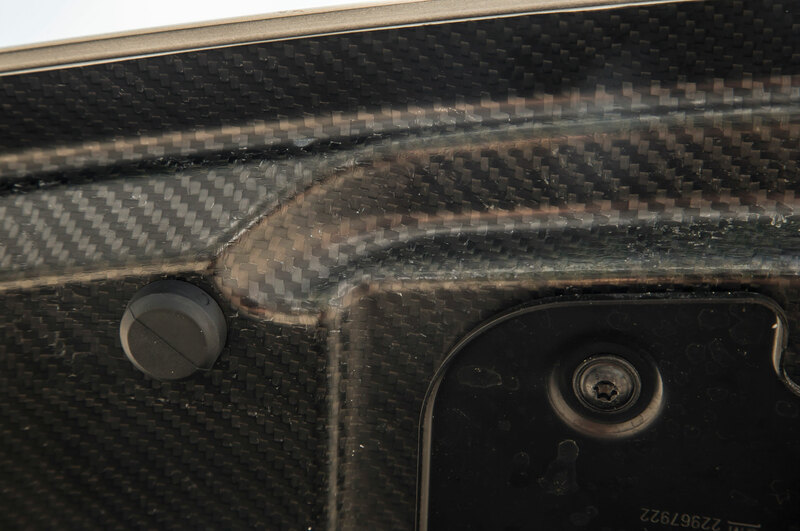 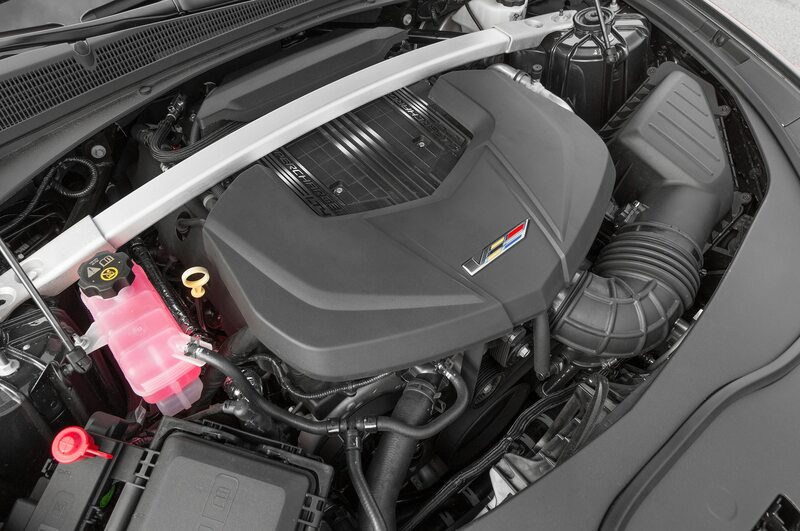 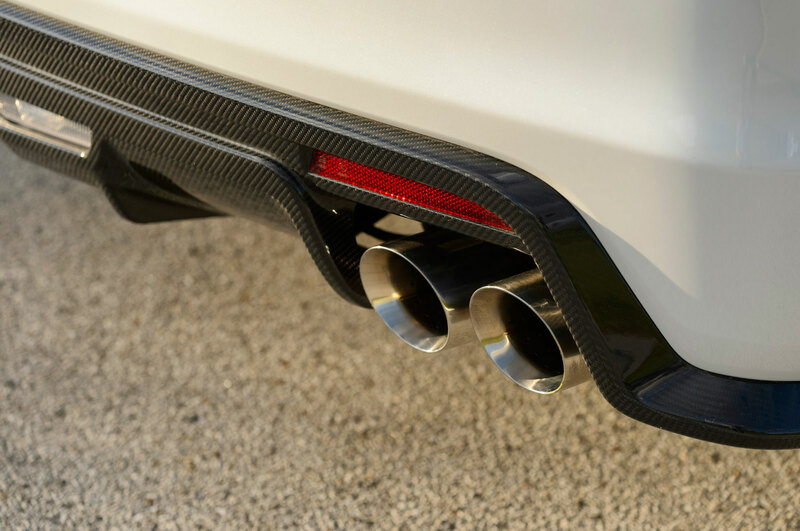 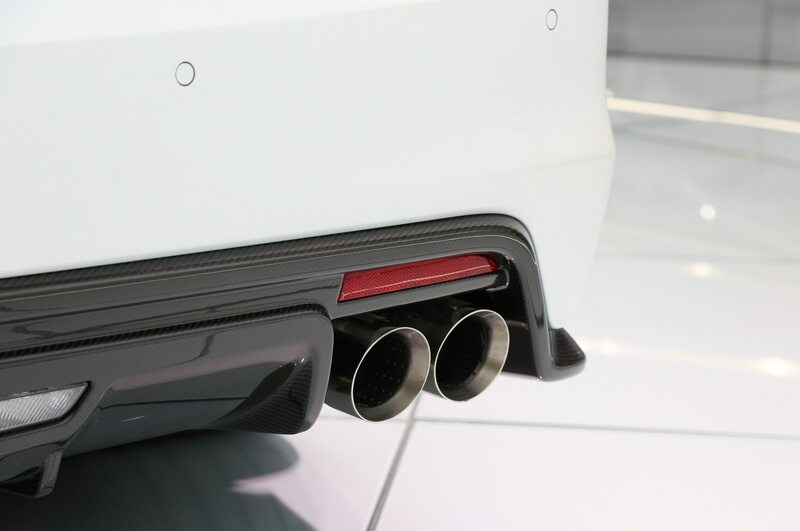 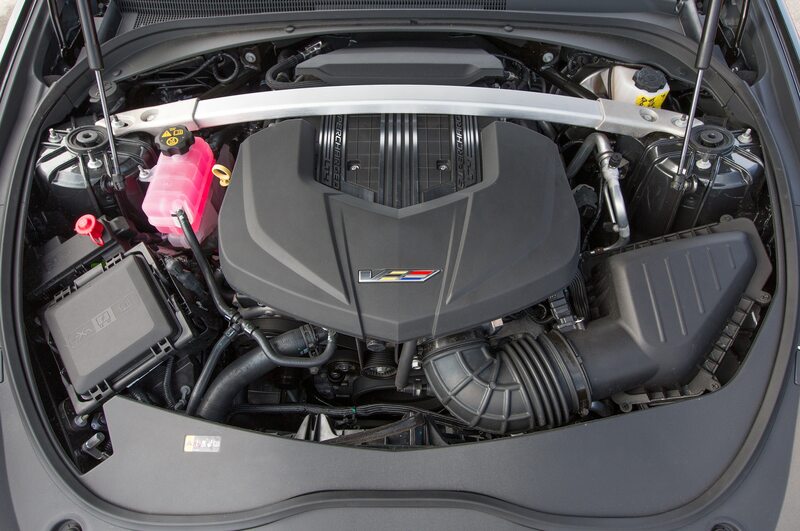 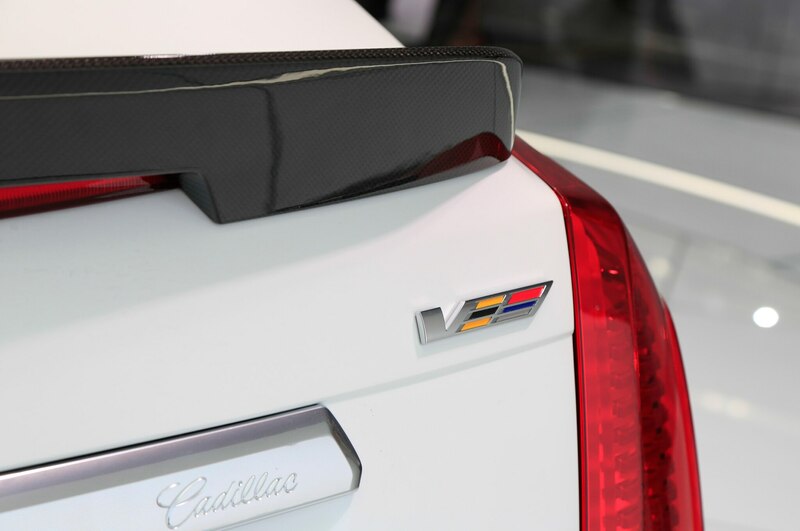 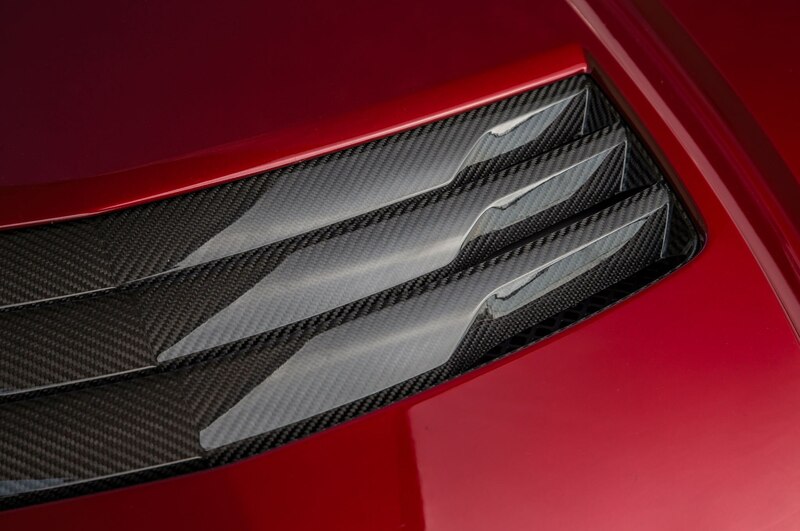 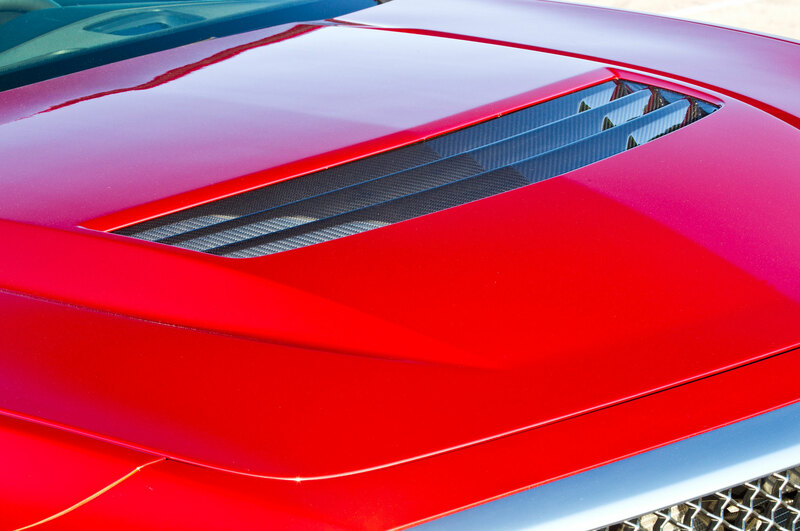 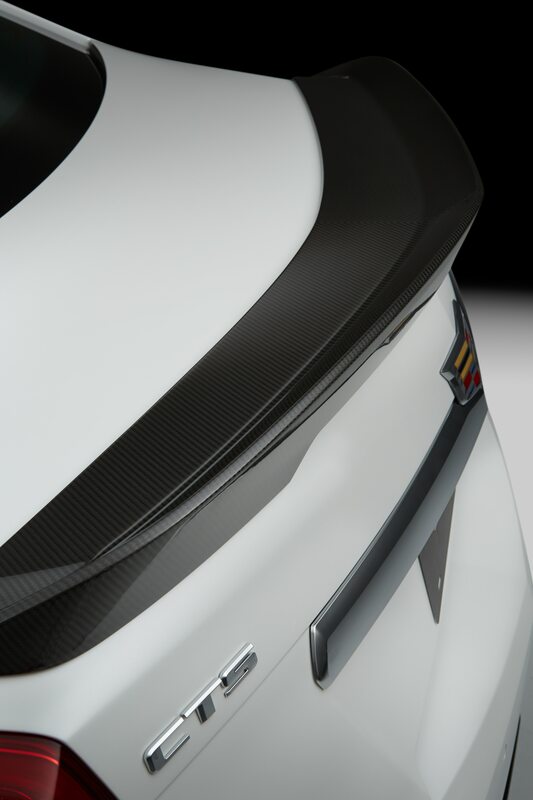 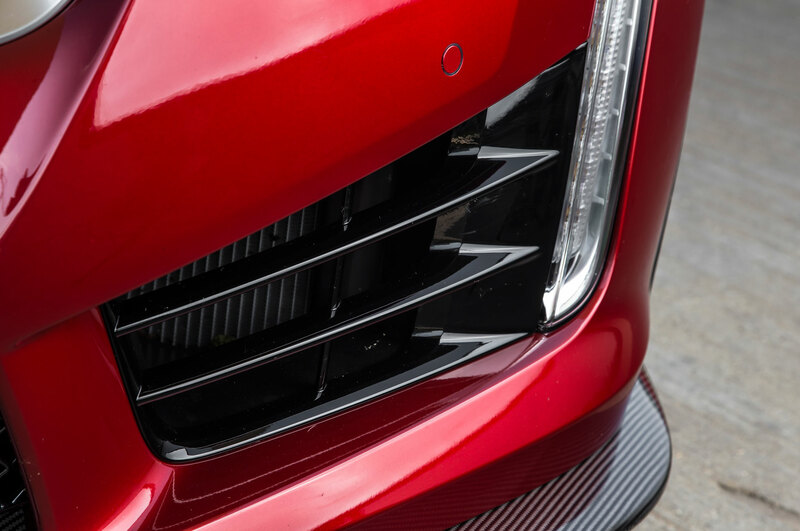 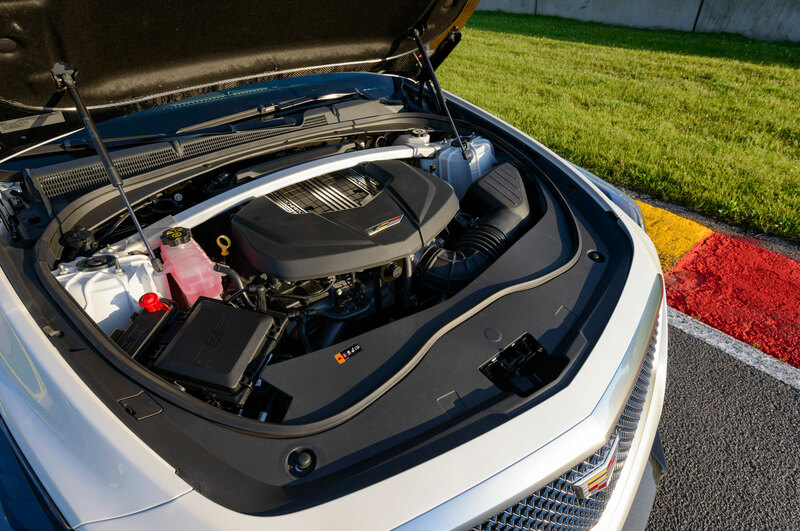 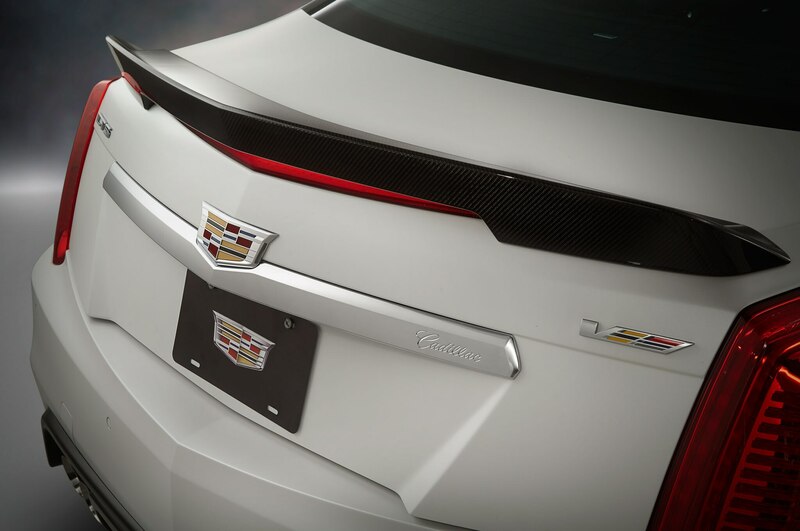 The 2016 Cadillac CTS-V’s standard carbon-fiber hood (an optional carbon-fiber package adds the material to the hood’s air extractor, the front splitter and rear diffuser, and the subtle rear-lip spoiler) covers a 640-horsepower, 630-lb-ft wet sump version of the new Corvette Z06’s supercharged, gas direct-injected 6.2-liter small-block V-8. 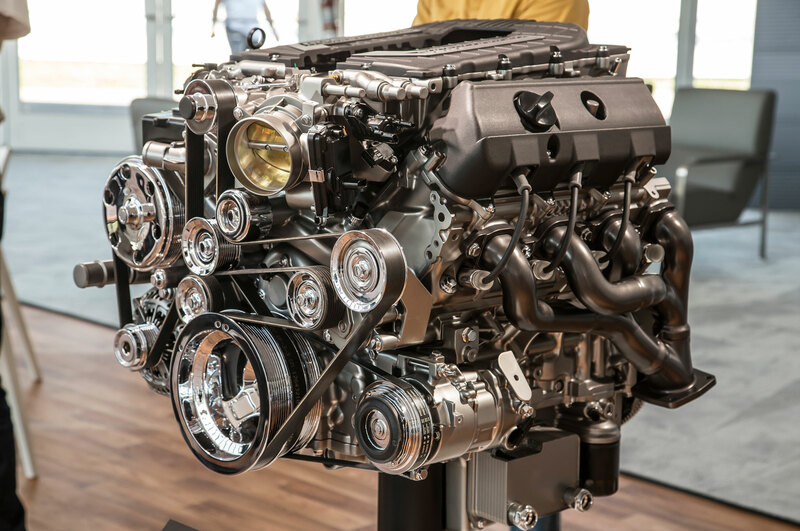 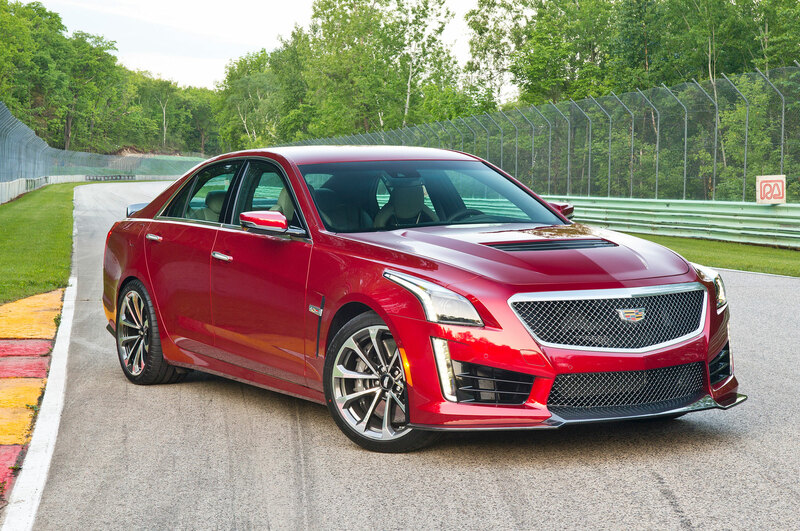 There’s cylinder deactivation in hopes that the new 2016 Cadillac CTS-V will escape the EPA gas-guzzler tax the previous model could not. 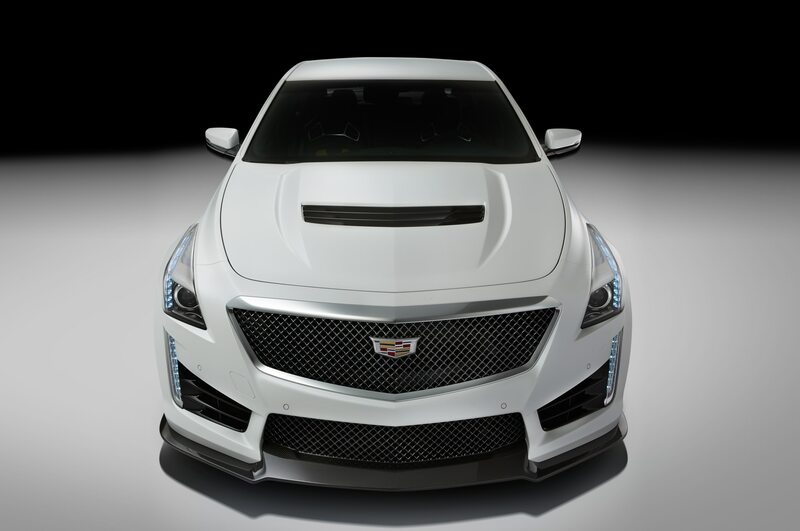 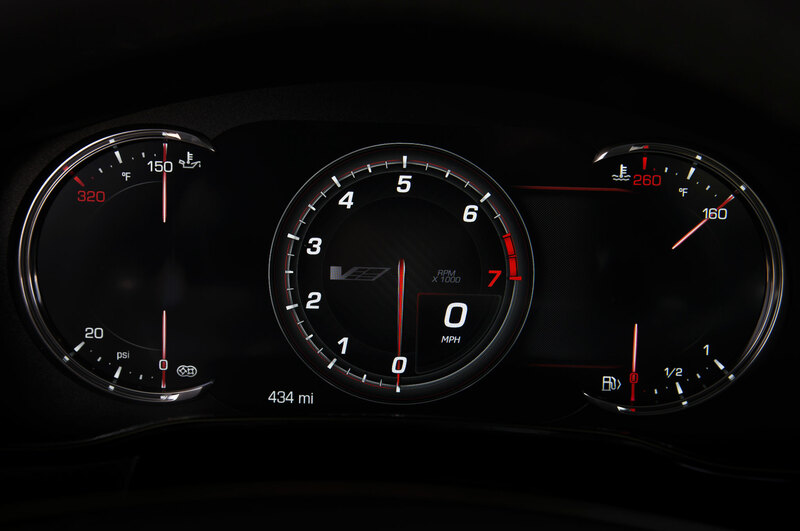 The horsepower number is up 84 over the second-gen CTS-V, which itself bettered the first model by 156 ponies. 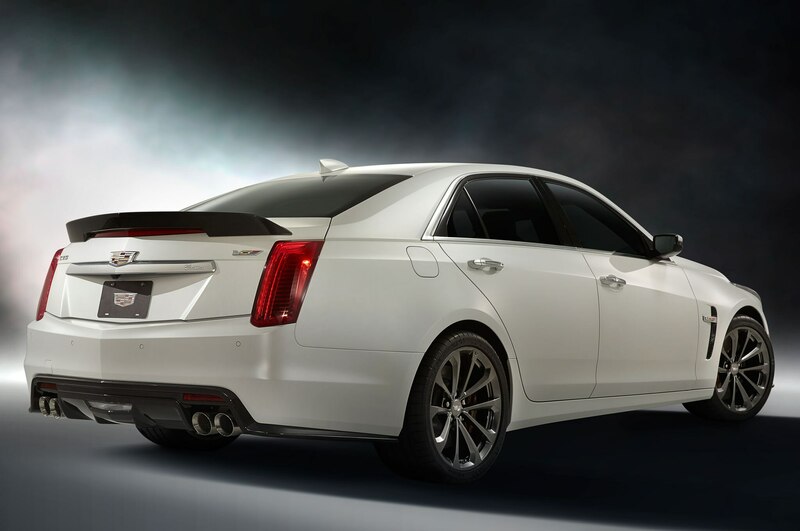 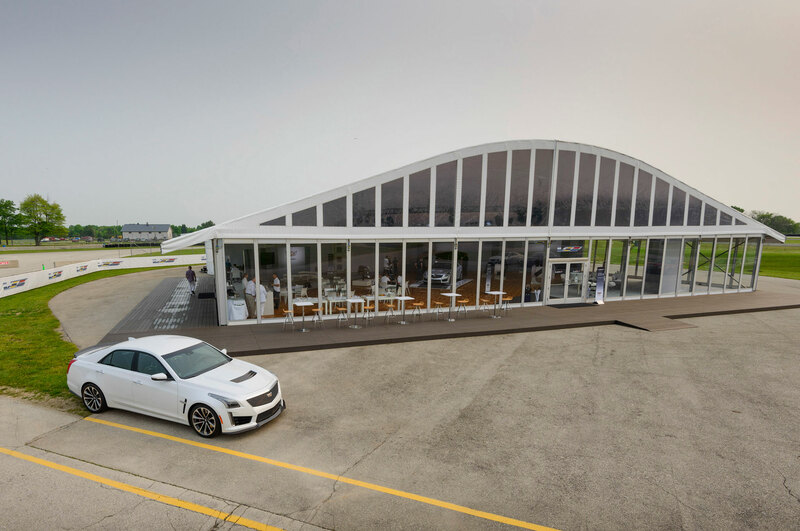 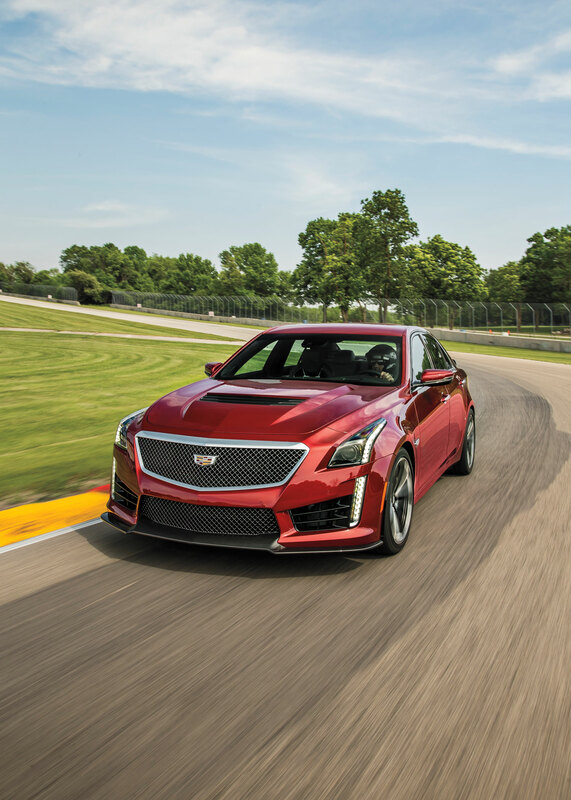 Cadillac claims a 0-60 mph time of 3.7 seconds for the 2016 CTS-V (thanks in part to standard launch control) and a top speed of 200 mph, and says that betters the BMW M5 by 0.4 second and 45 (speed-governed) mph. 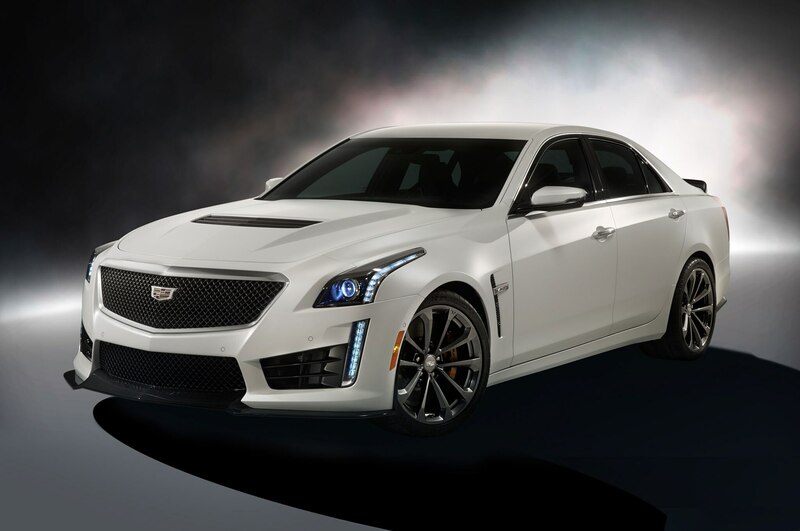 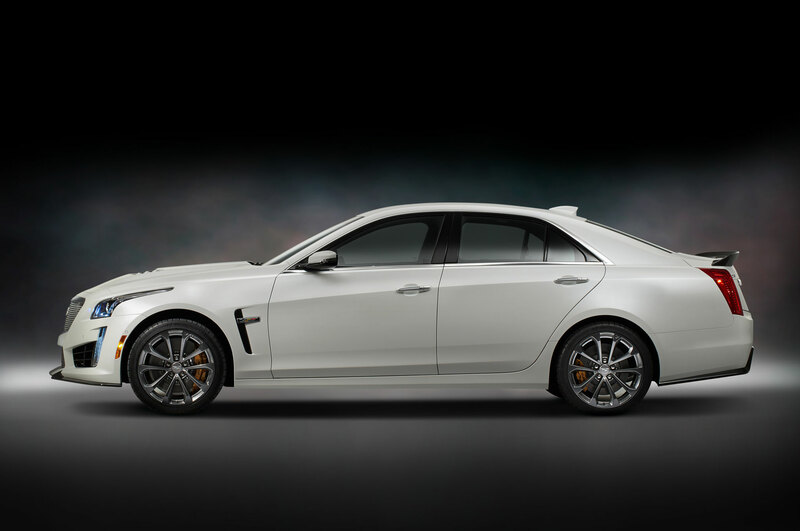 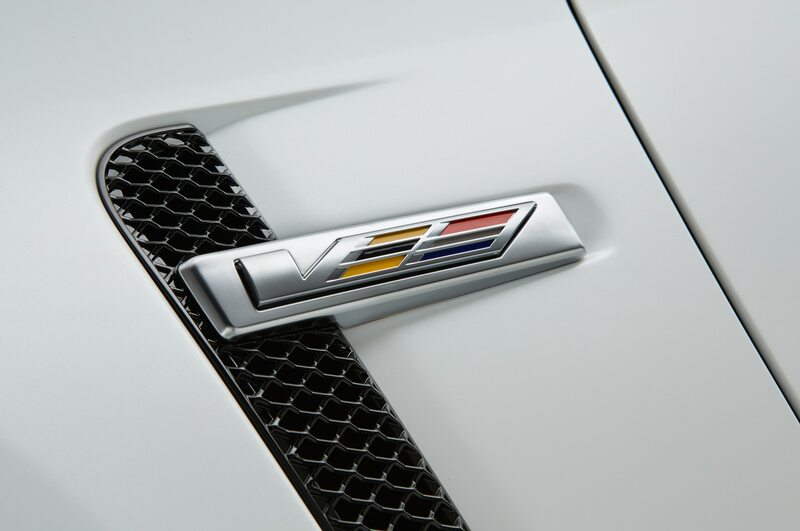 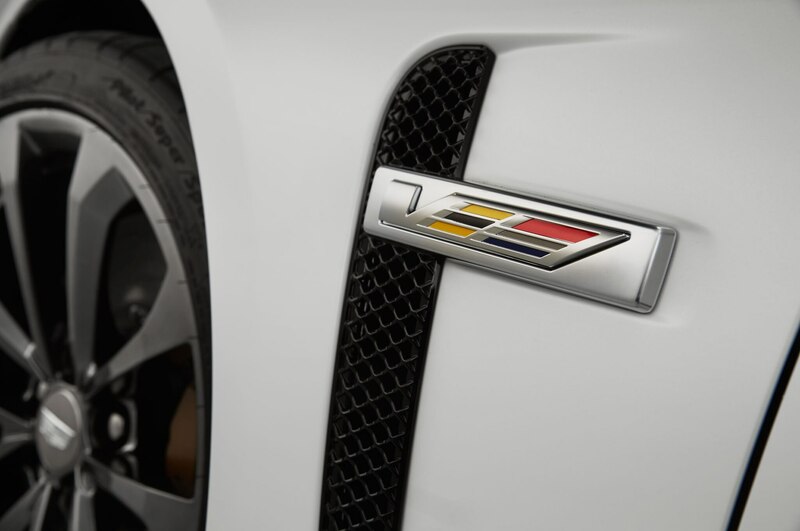 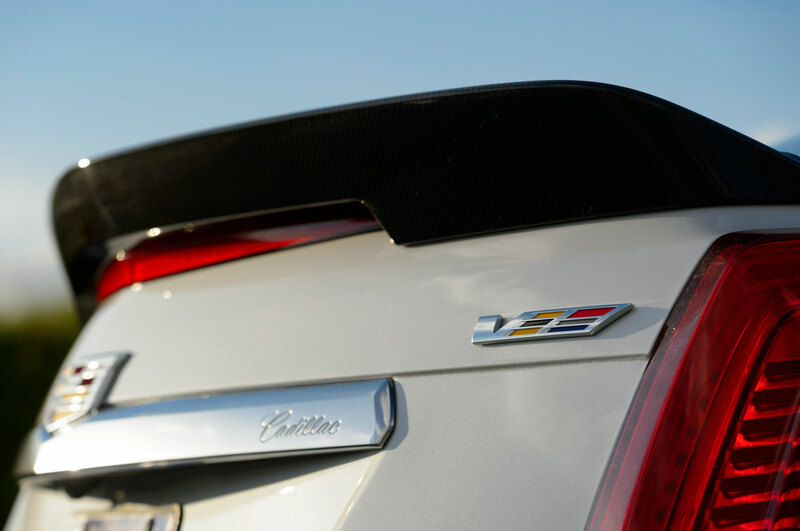 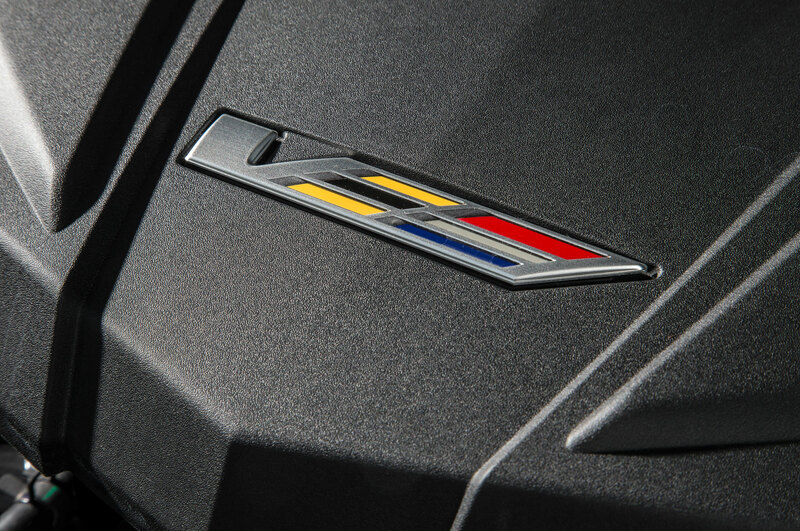 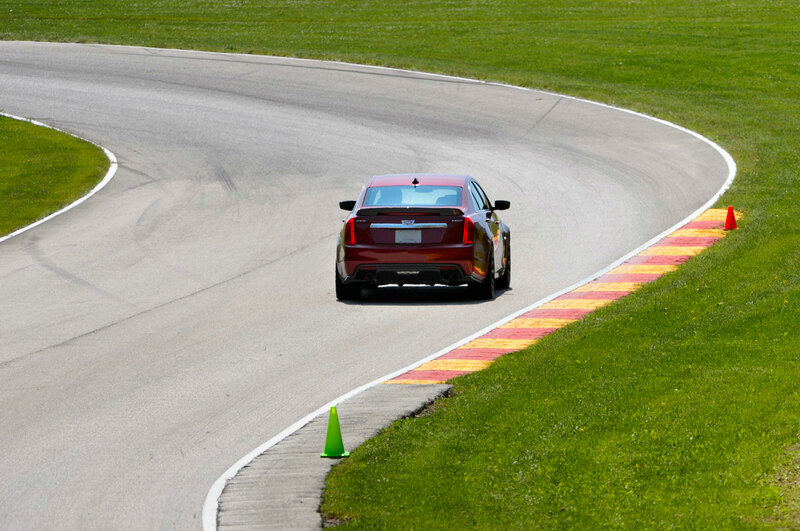 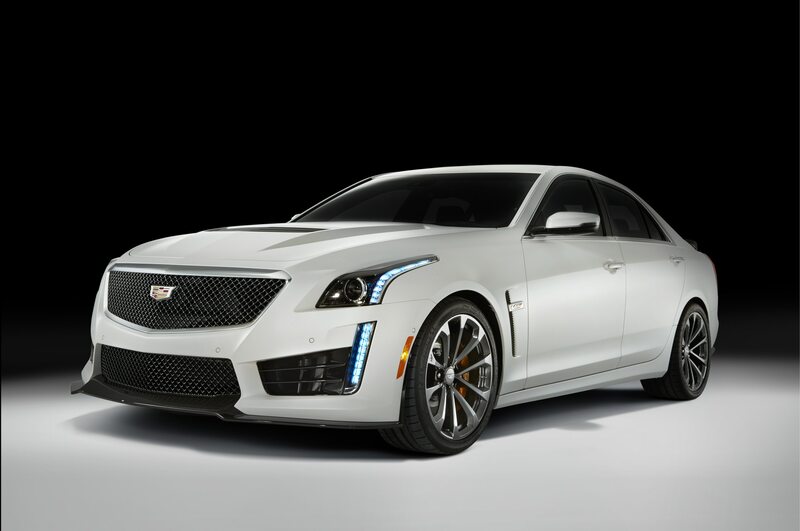 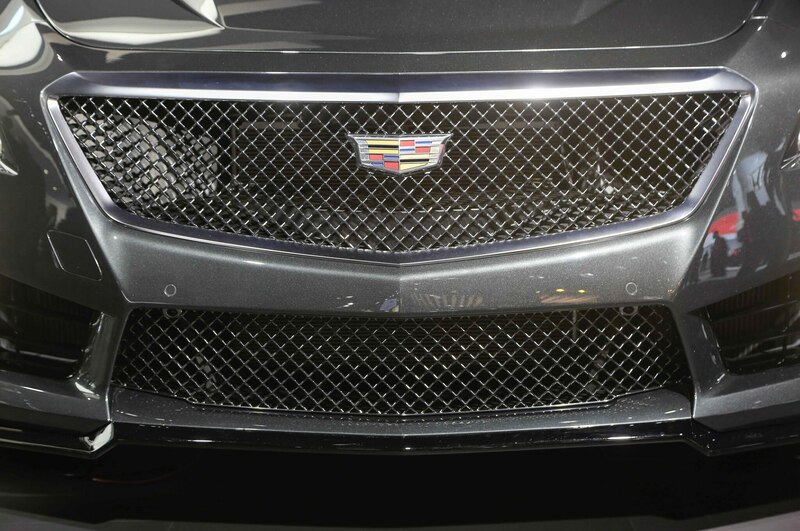 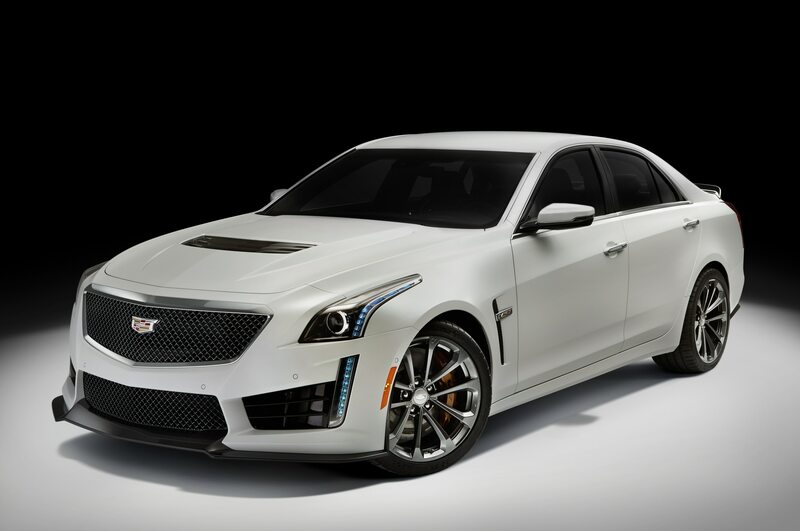 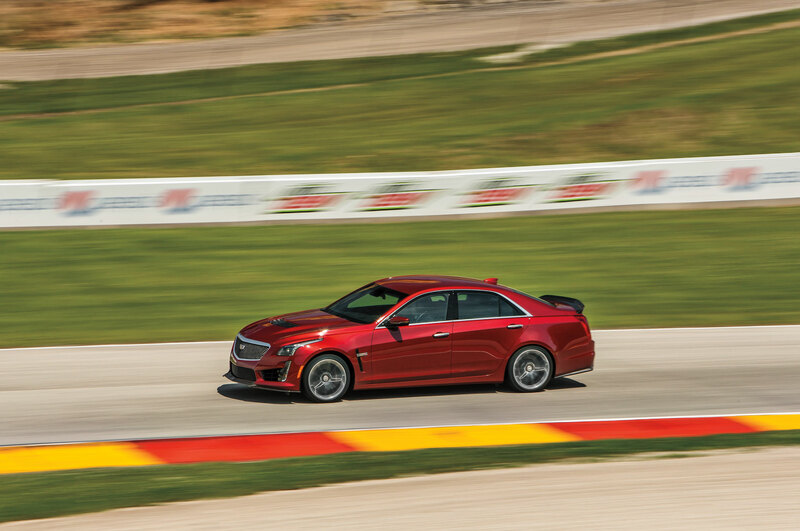 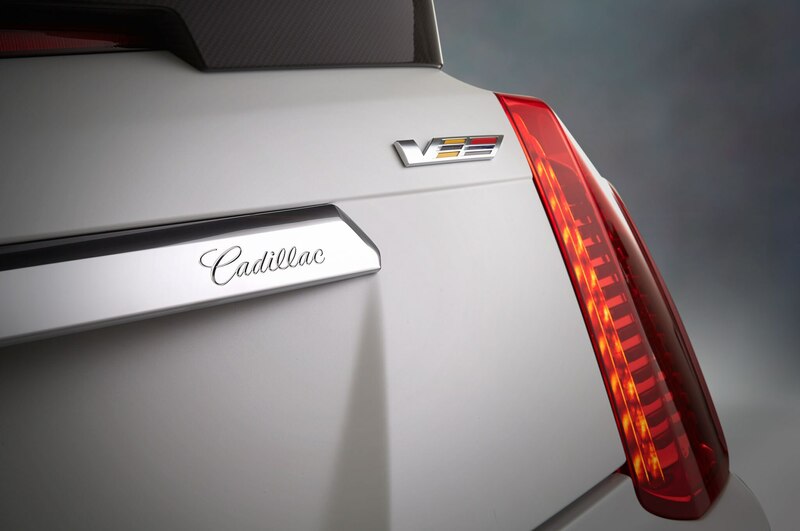 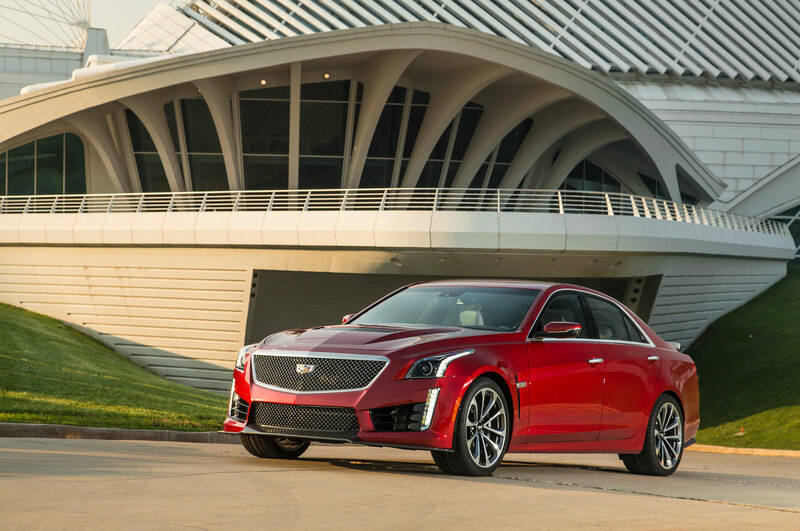 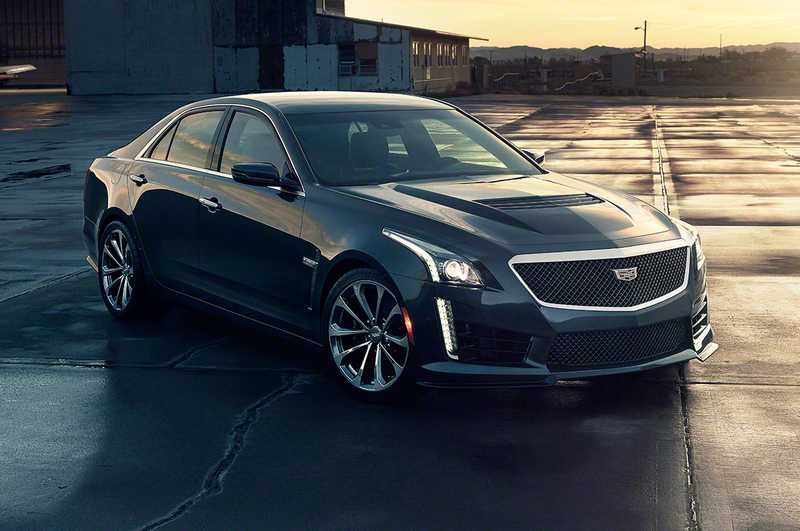 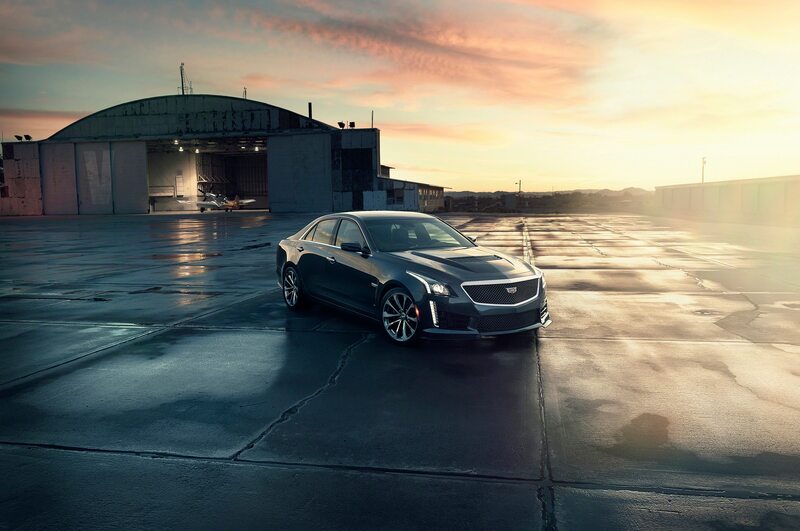 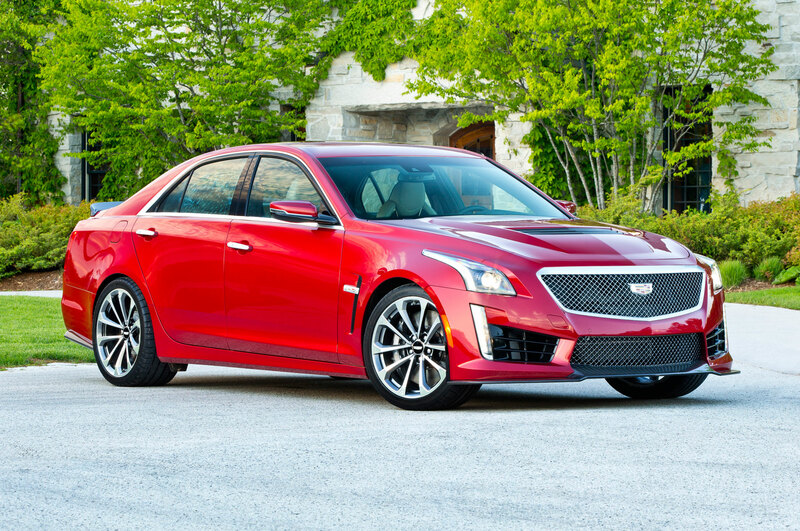 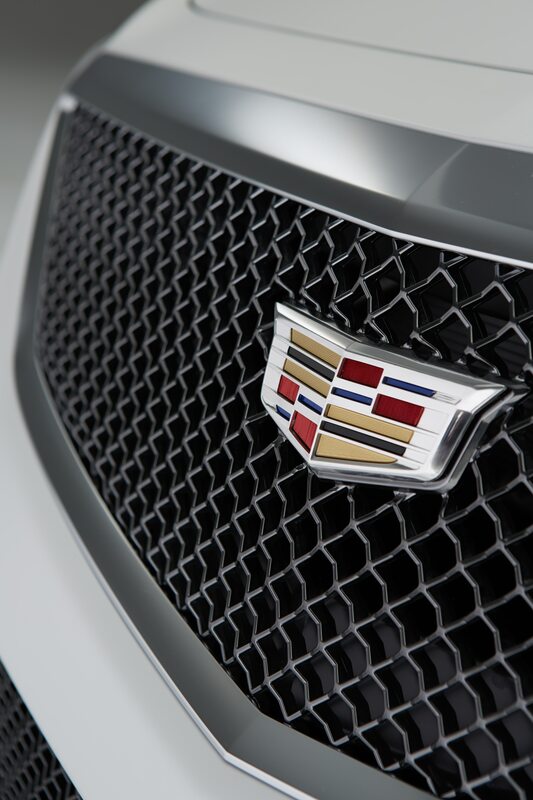 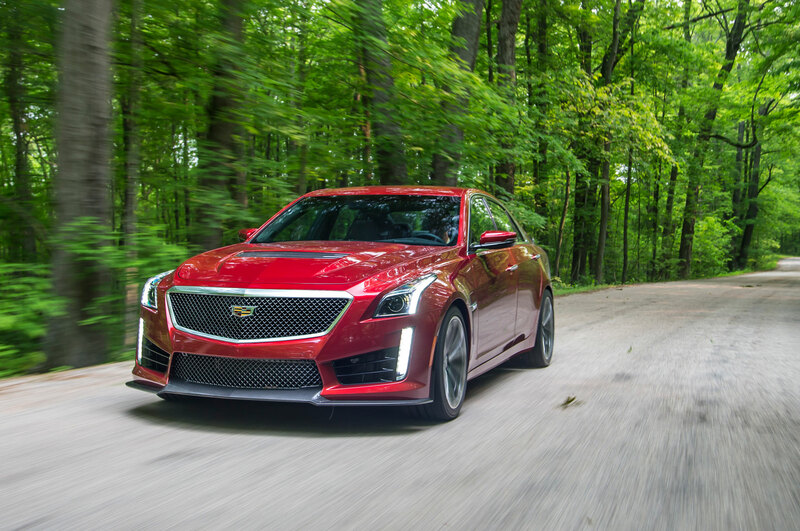 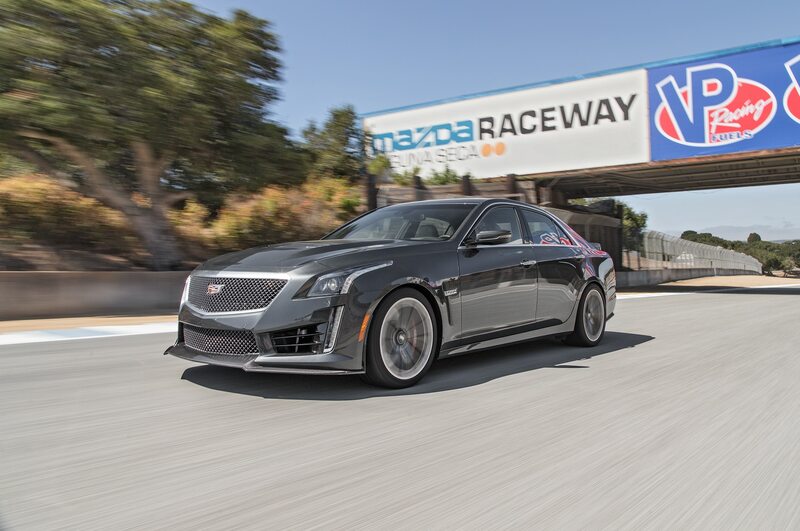 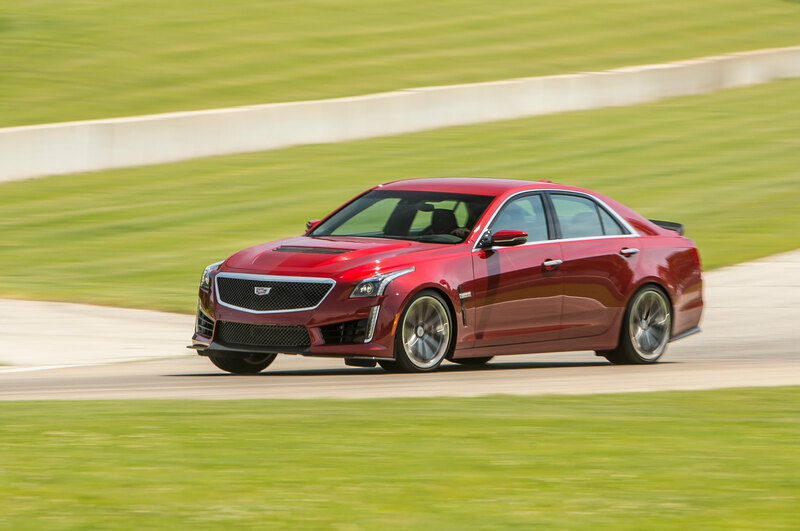 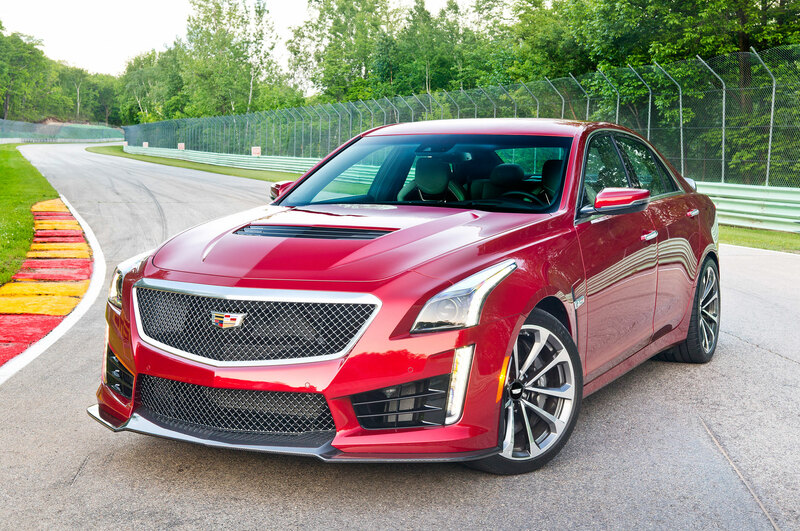 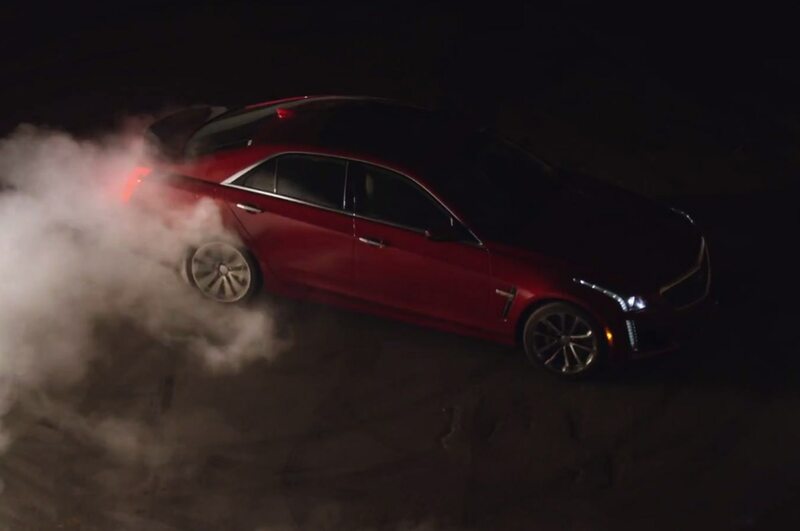 Cadillac says the CTS-V is 0.1 second quicker and 7 mph faster than the Mercedes-Benz E63 AMG. 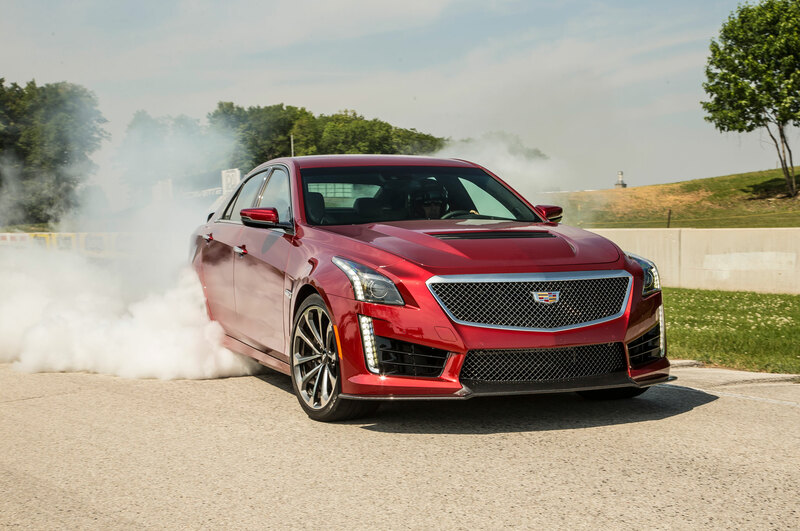 We’ll have to wait until a first drive later this year to verify it, but Cadillac is hinting that the new CTS-V is closer to the Bimmer in terms of its sharp handling and steering and ride/handling balance. 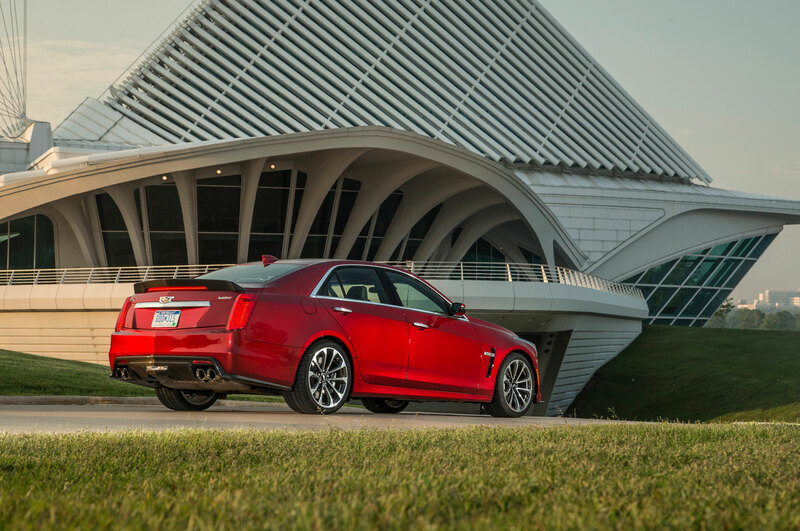 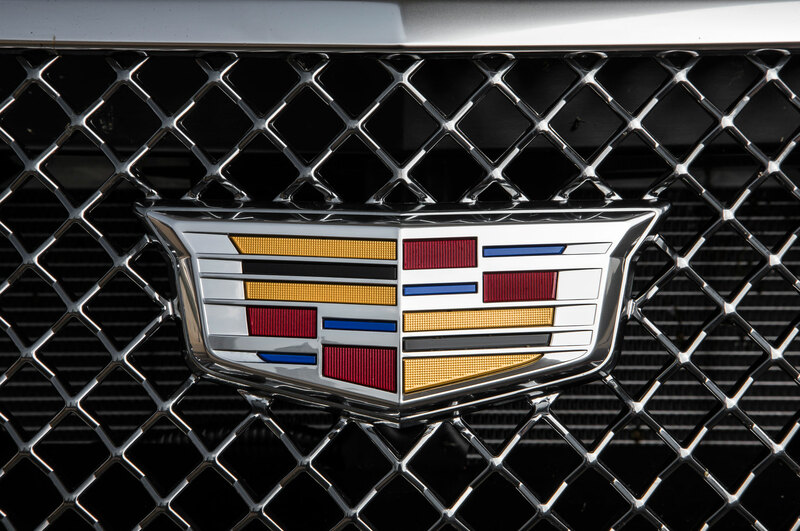 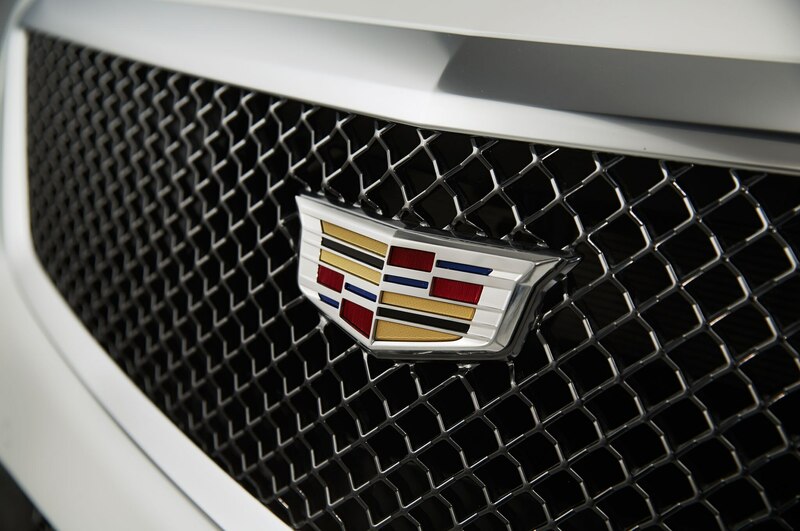 Unlike with the M5, however, Cadillac isn’t offering a stick shift for American enthusiasts. 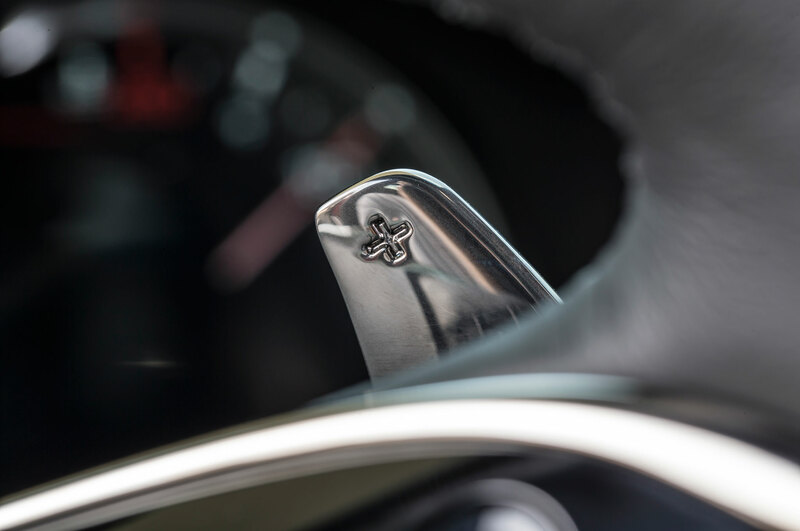 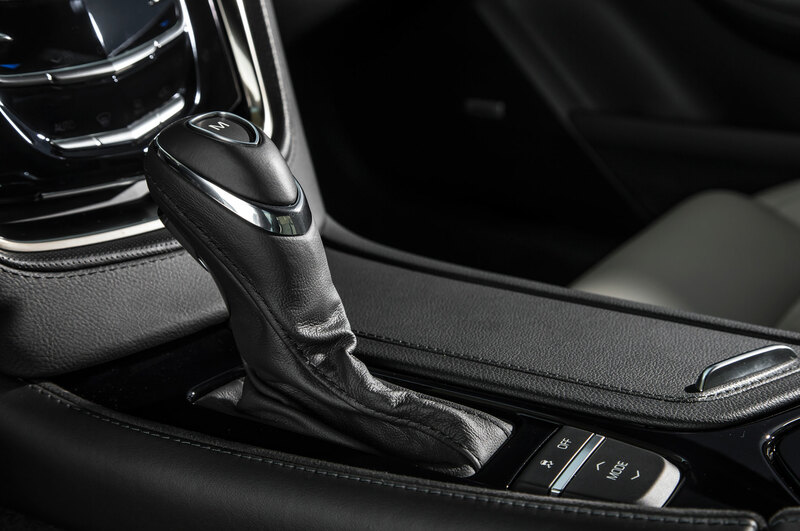 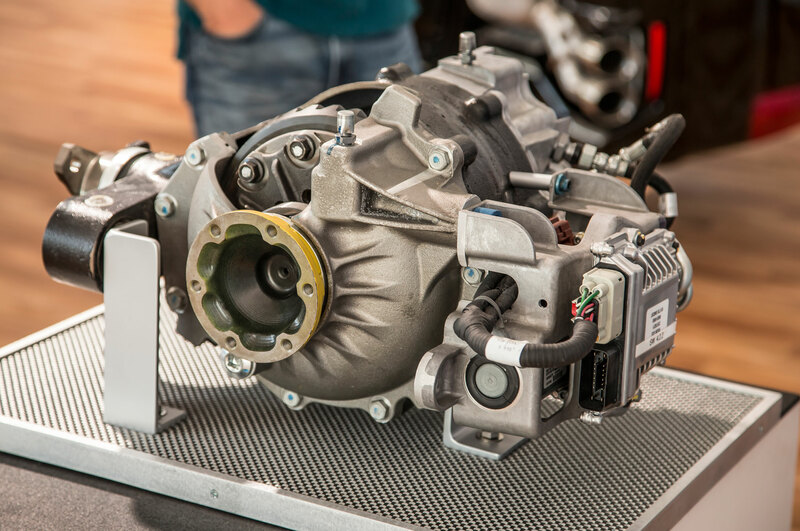 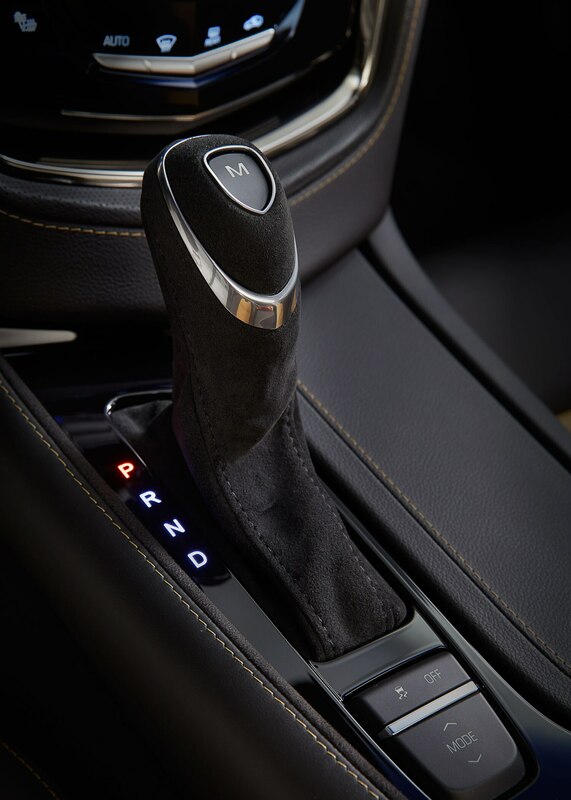 The only transmission will be General Motors’ new eight-speed automatic with paddle shifters. 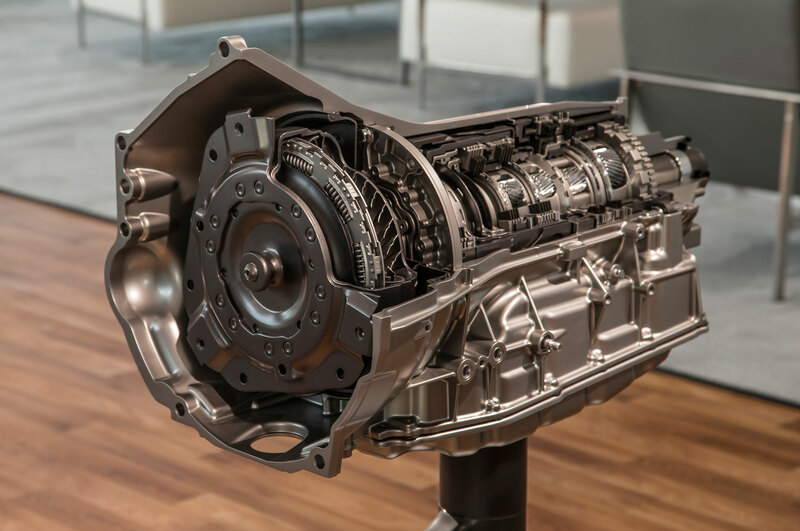 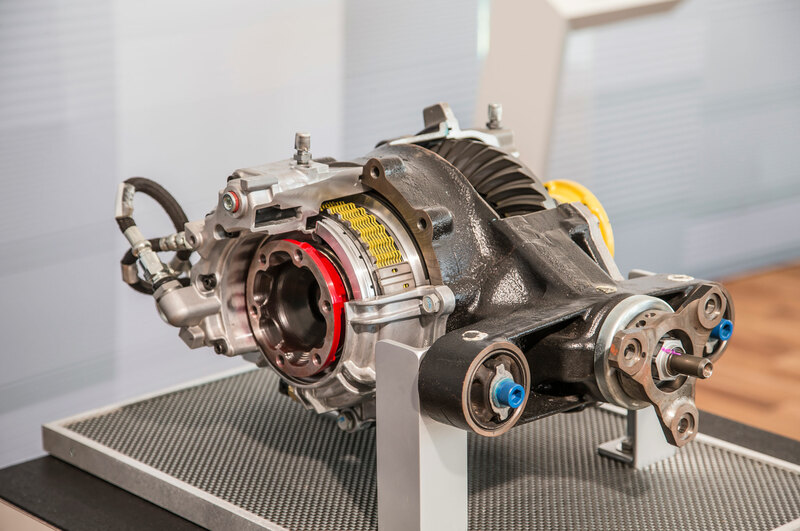 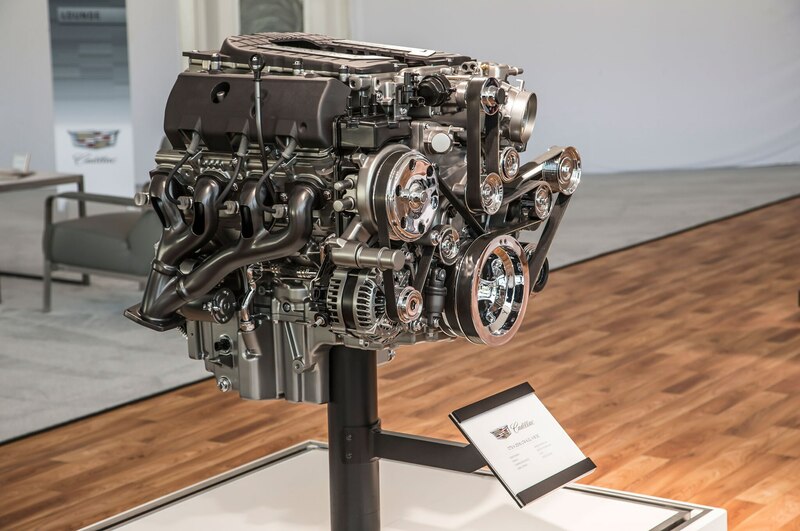 It’s 28 pounds lighter than the six-speed automatic it replaces, it shifts faster, and it fits into the same space behind the longitudinal V-8. 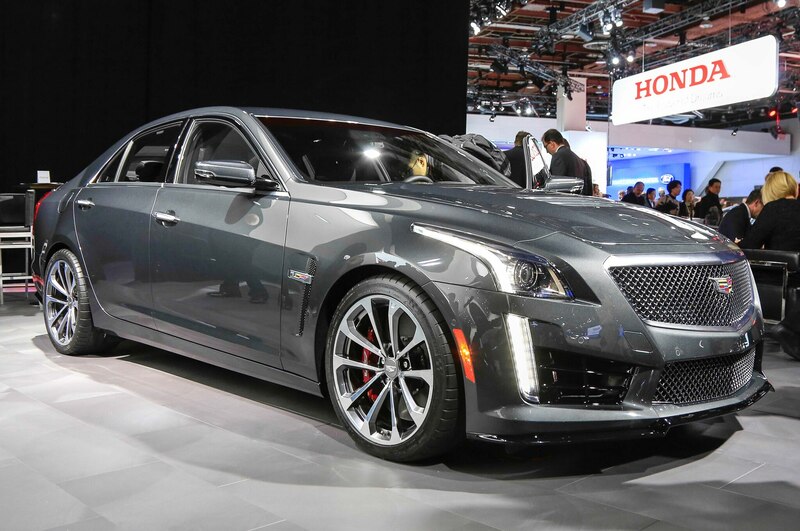 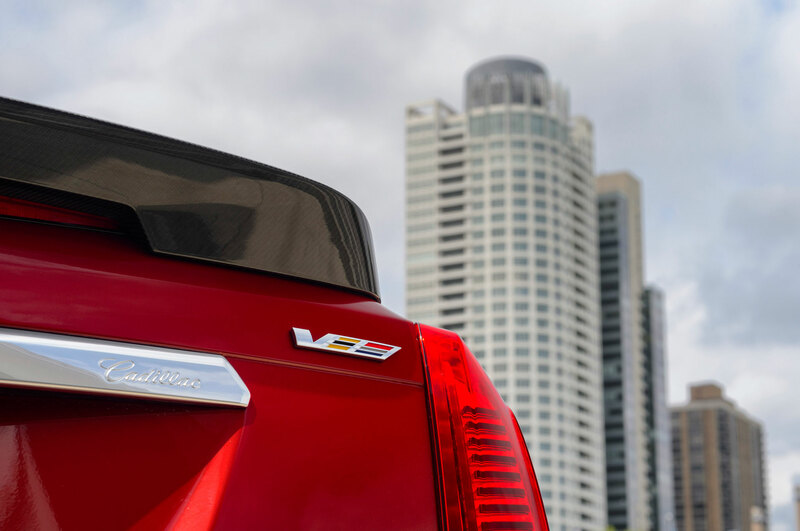 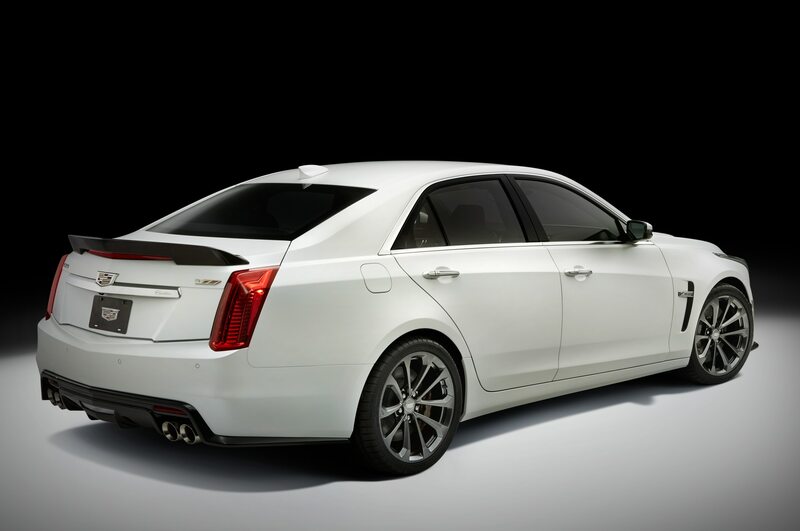 Overall weight is 4,145 pounds, about 135 pounds lighter than the previous CTS-V. Want a manual performance Cadillac? 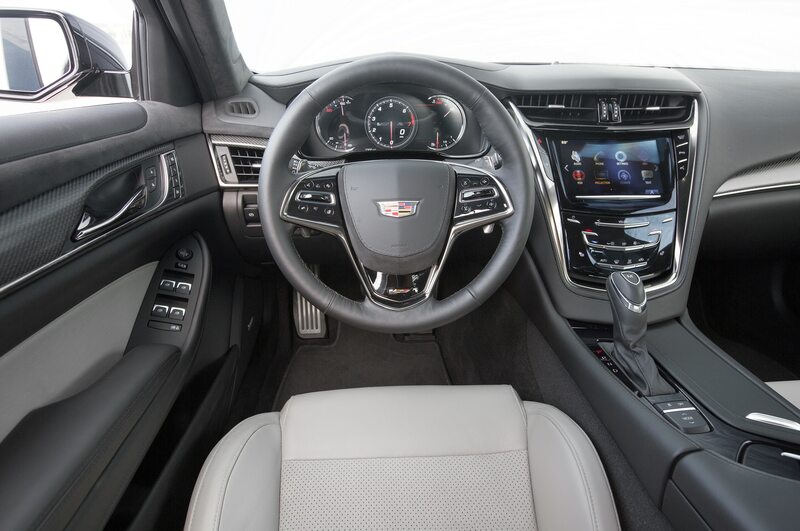 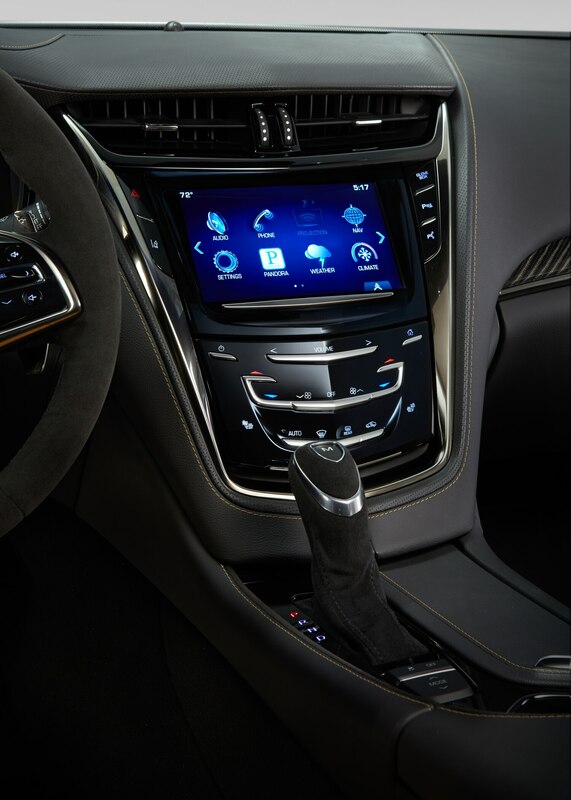 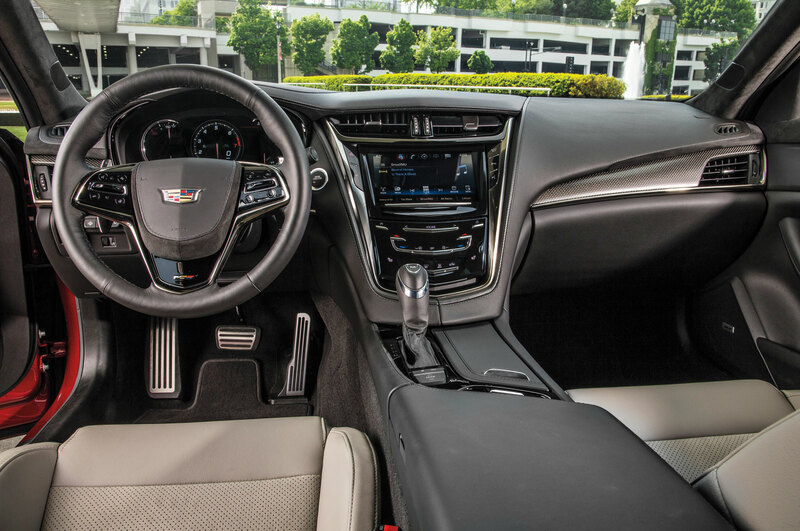 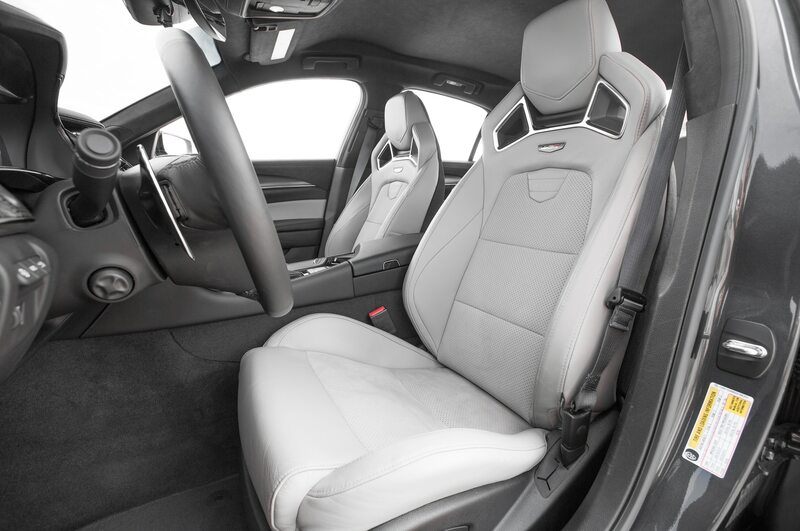 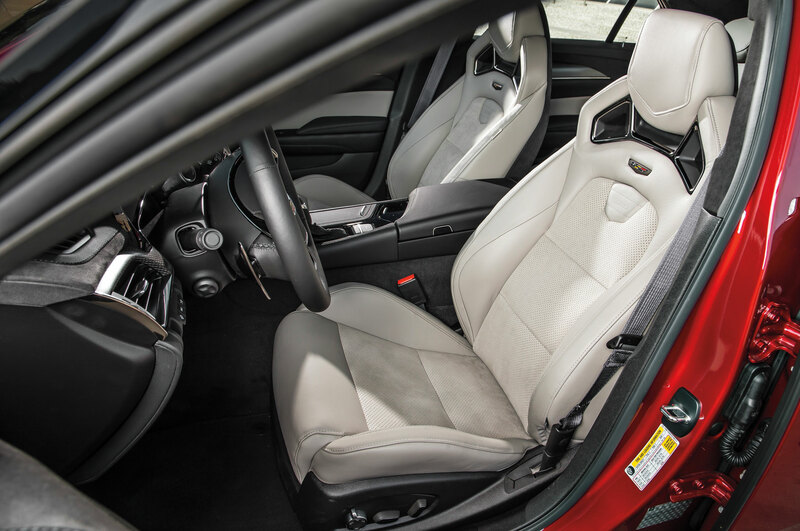 Then you’ll have to downshift and downsize to the 2016 Cadillac ATS-V, with its six-speed manual option. 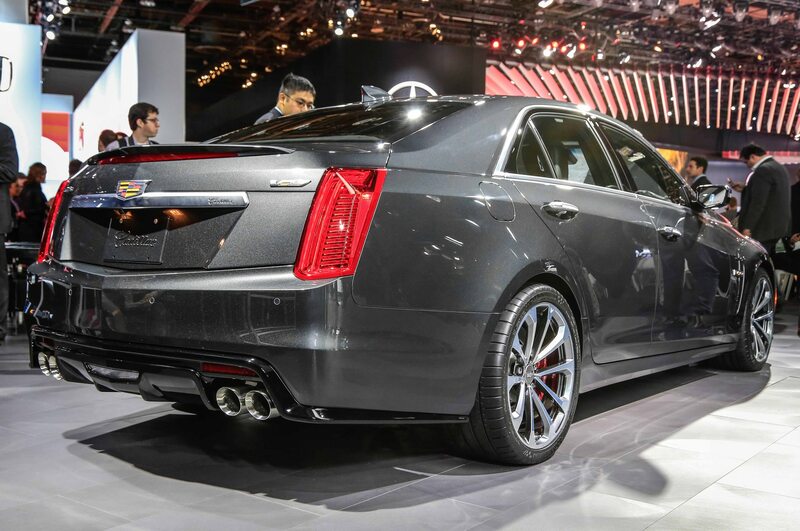 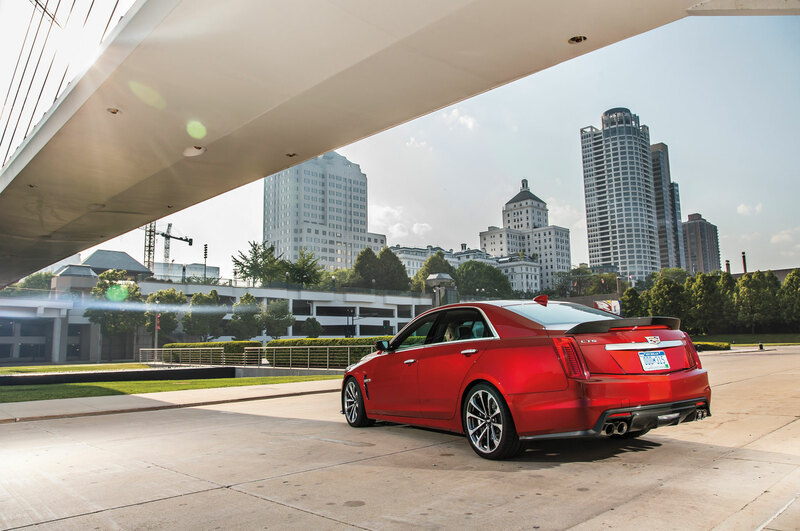 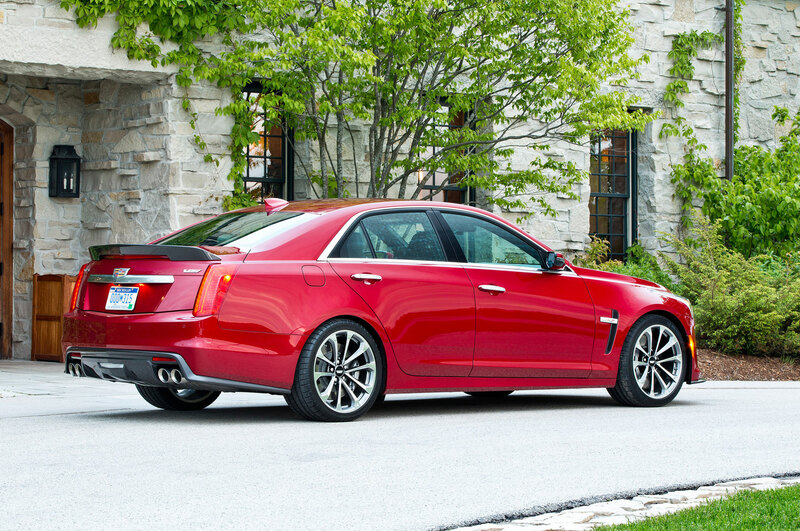 The ATS-V goes on sale by early summer of 2015. 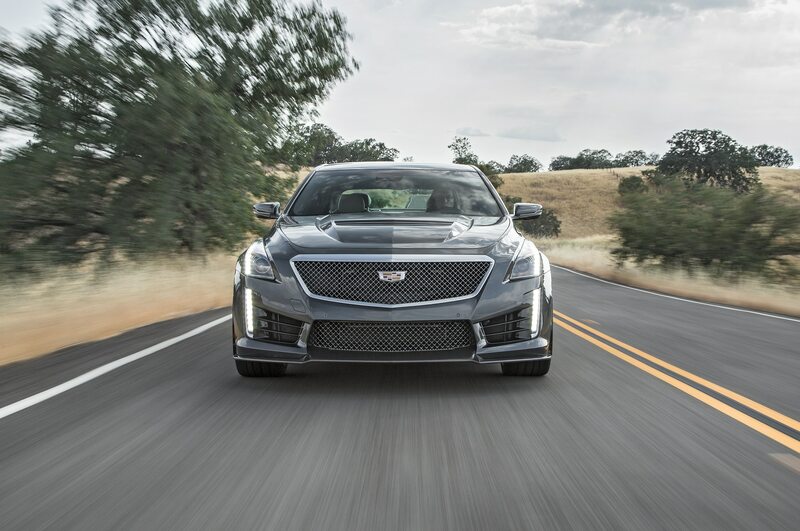 Cadillac executive chief engineer David Leone says the CTS-V’s lateral acceleration number will come up just south of 1.0 g. “Could we crank it up even more? 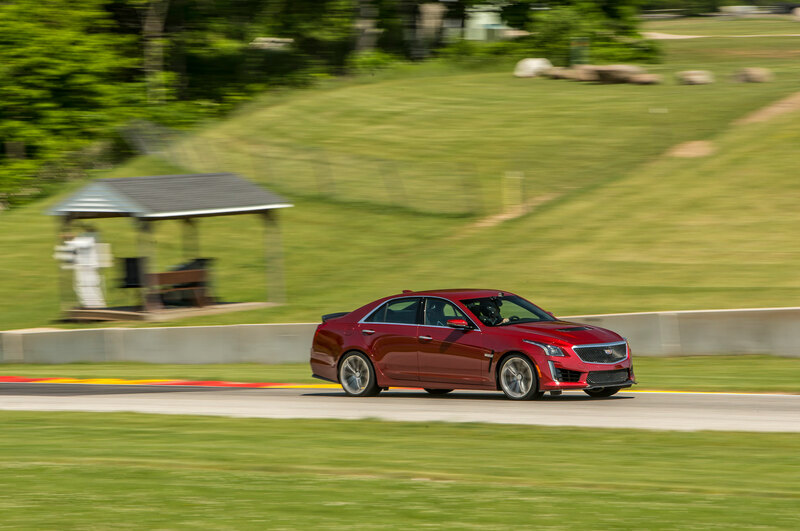 Yes, we could, but then it wouldn’t be delightful to drive every day.” The car also has GM’s third-generation Magnetic Ride Control with 40 percent faster response time and a new twin-wire, dual-coil damper providing 40 percent more control, according to Cadillac. 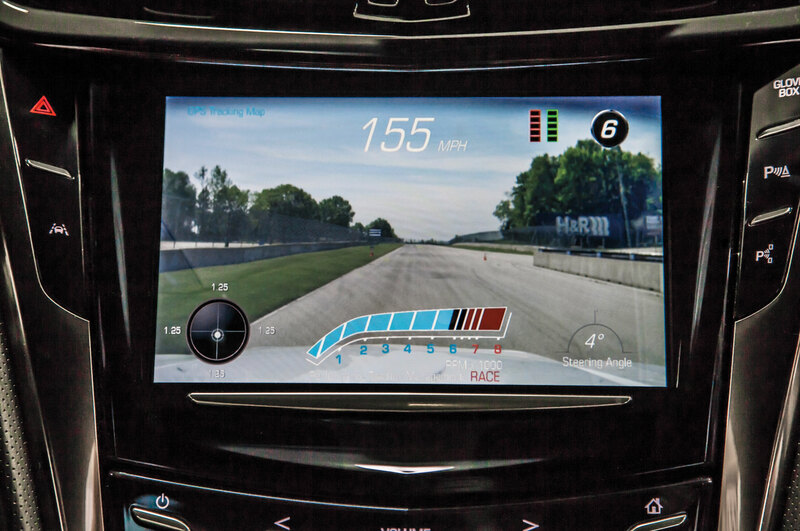 “The controller we use has three times the computing power of the last controller in terms of RAM — input/output — and it can respond faster. 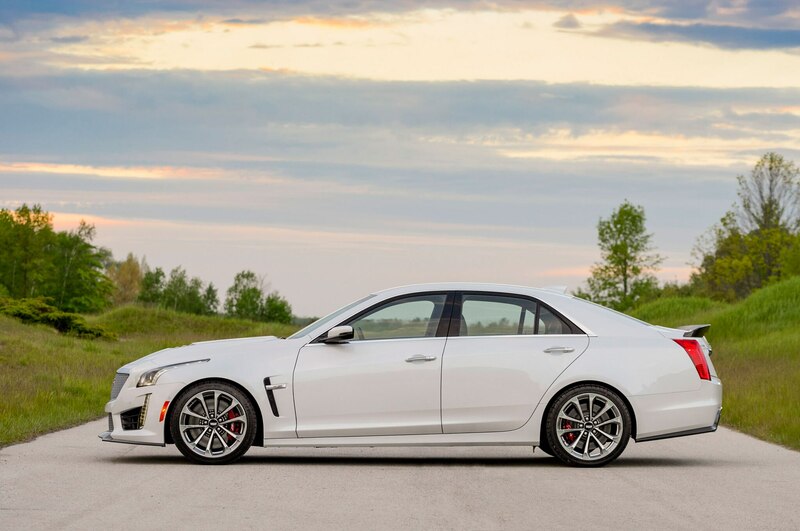 The dampers that you see have more control authority, they can respond faster, and this car actually has better isolation than the Vsport,” Leone says. 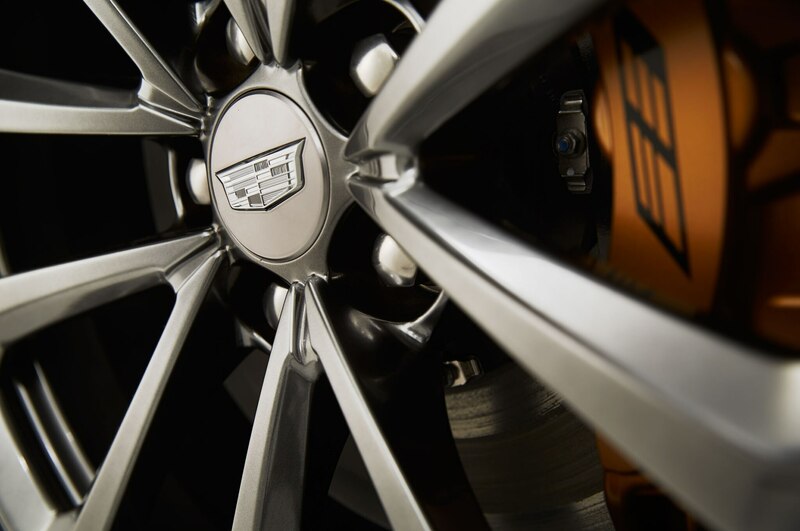 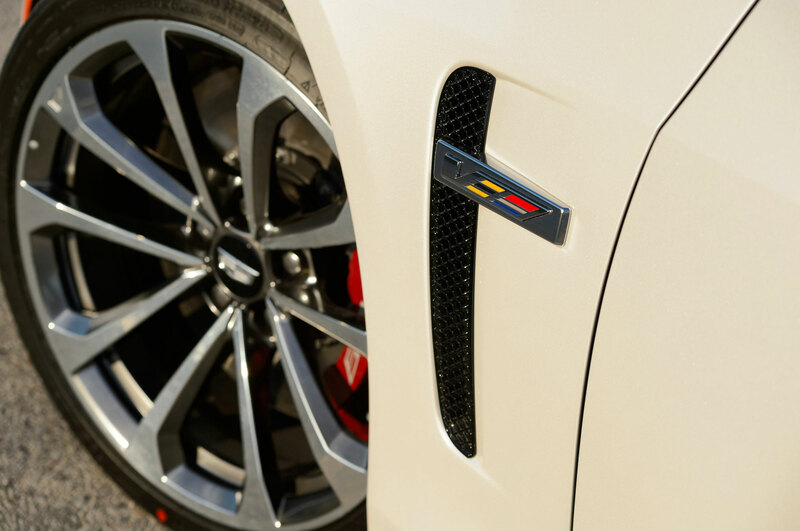 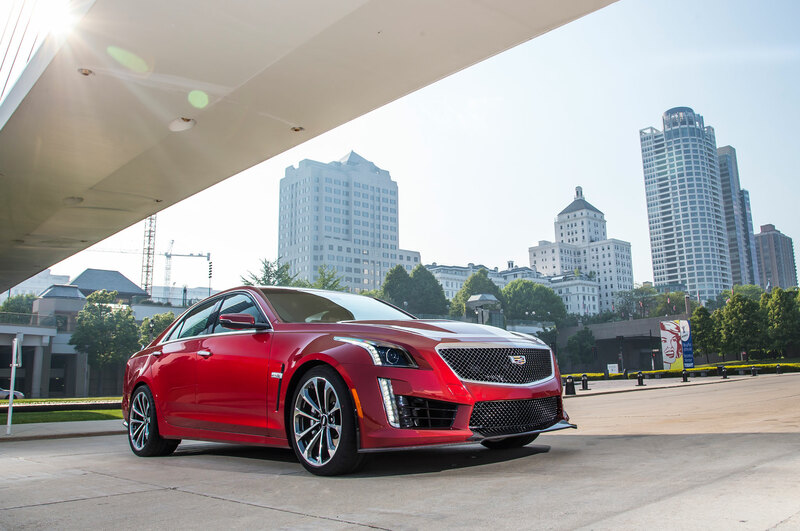 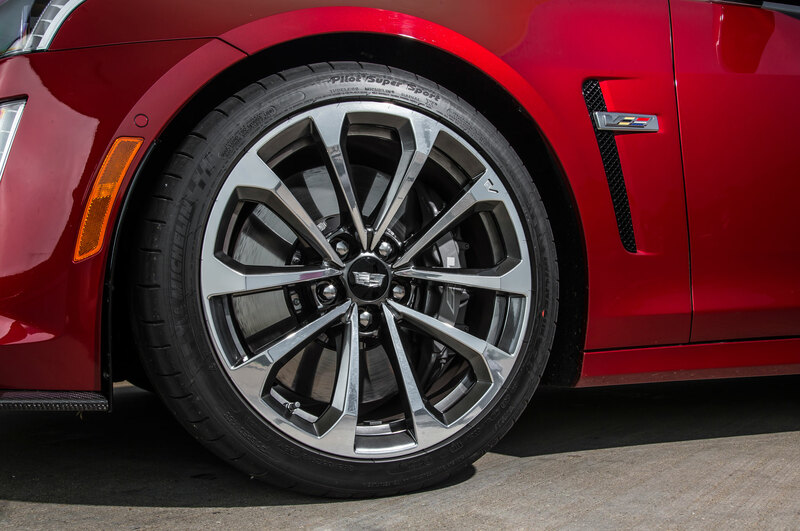 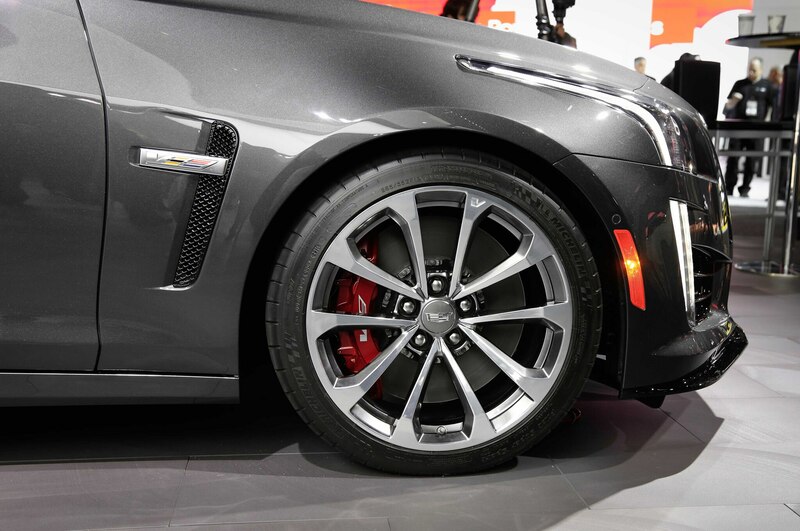 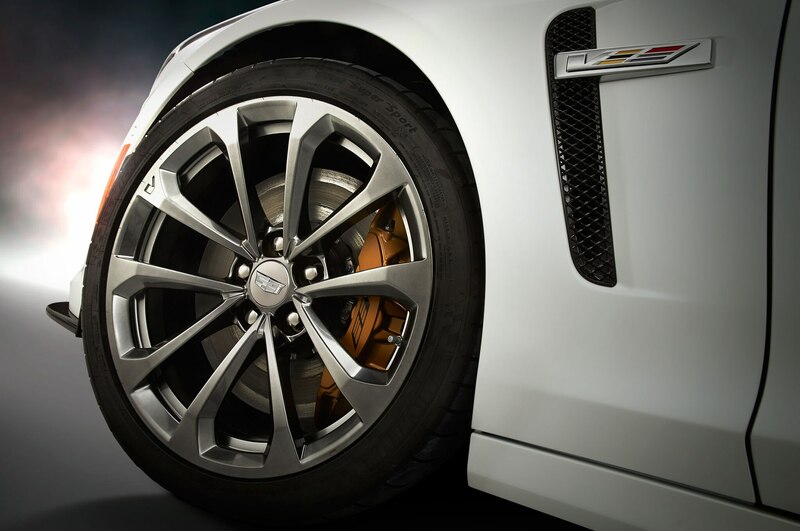 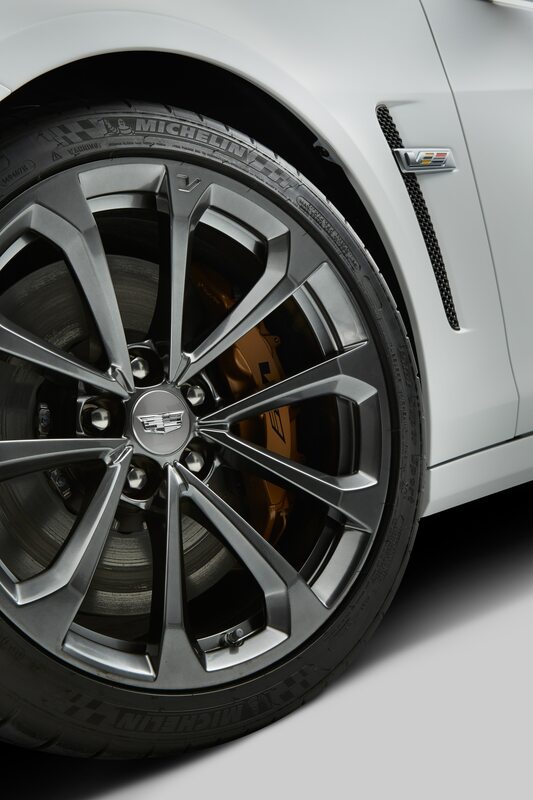 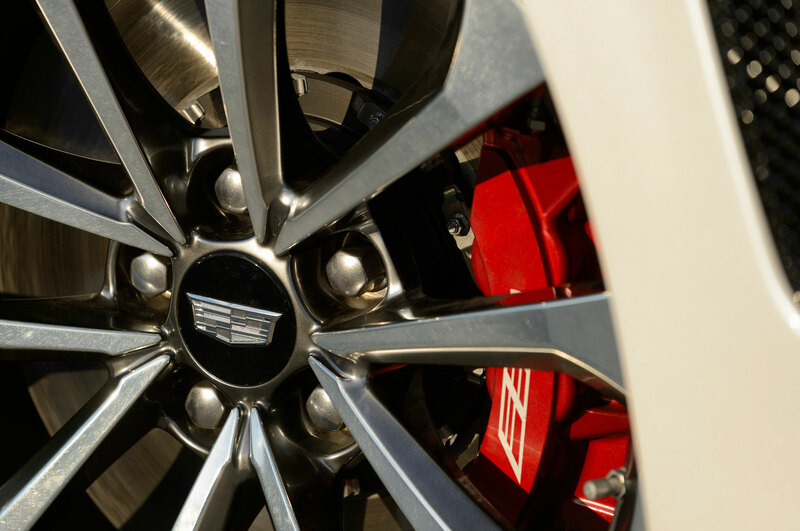 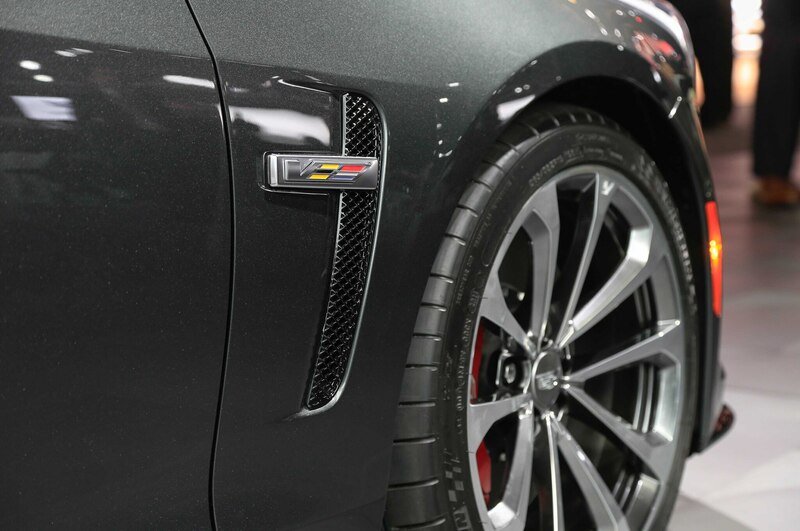 The 2016 Cadillac CTS-V runs on 19-inch wheels with 265/35-19 front and 295/35-19 rear Michelin Pilot Super Sport tires. 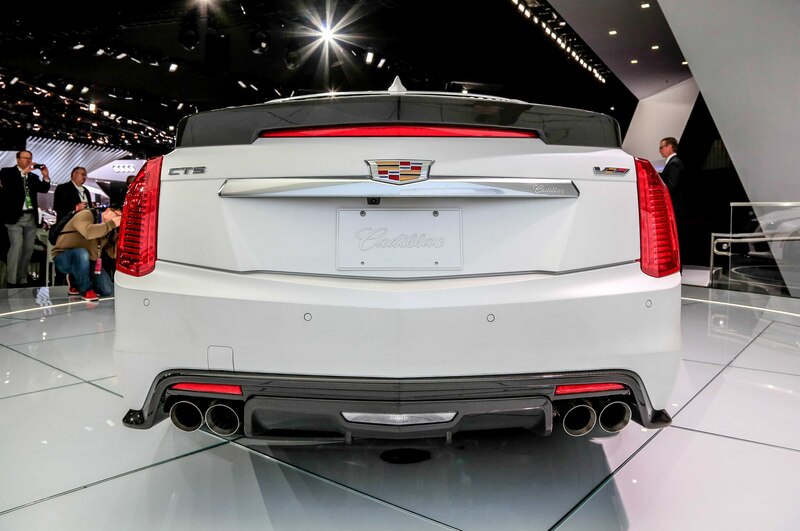 They’re wider than the standard CTS’s by 36mm in the front and 34mm in the rear, for “an incredible footprint,” Leone says. 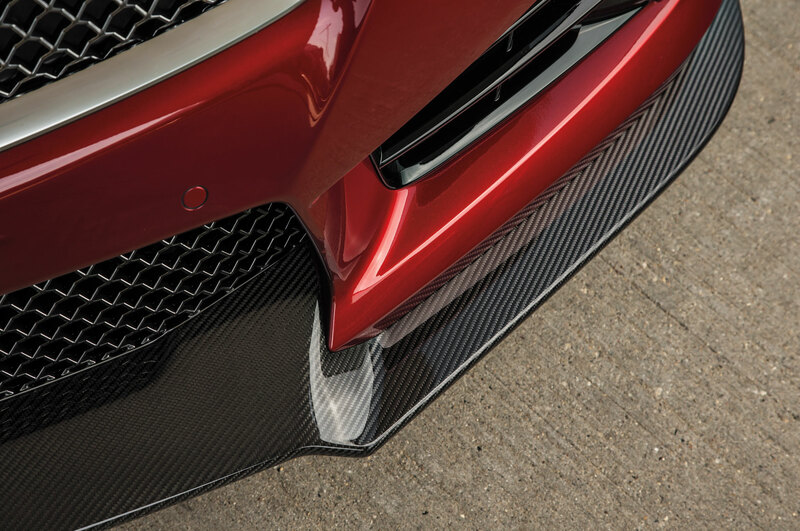 To accommodate the wider rubber, designers needed to extend the front fender lips outward by 0.8 inch. 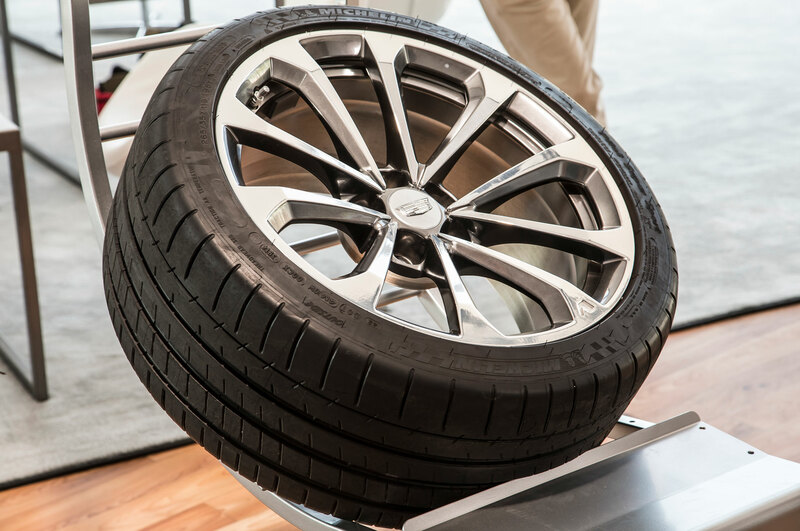 The tires are specially designed for the car and “give you improved steering response and maximum traction,” Leone says. 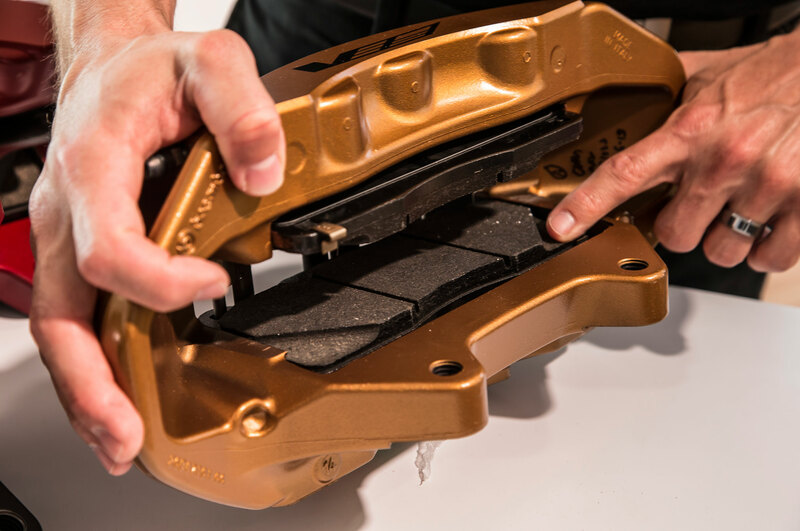 They use a stiff compound for the inside and third treads, a slow-wearing outer tread compound, and a softer, stickier compound for the second and fourth treads. 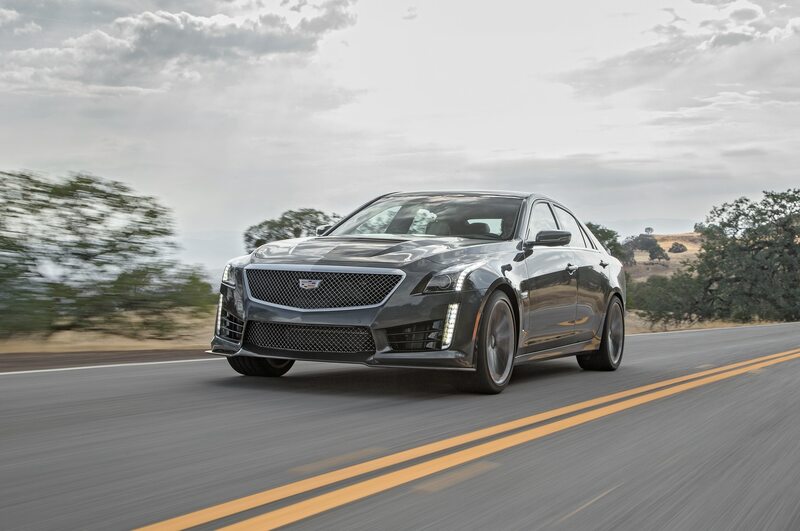 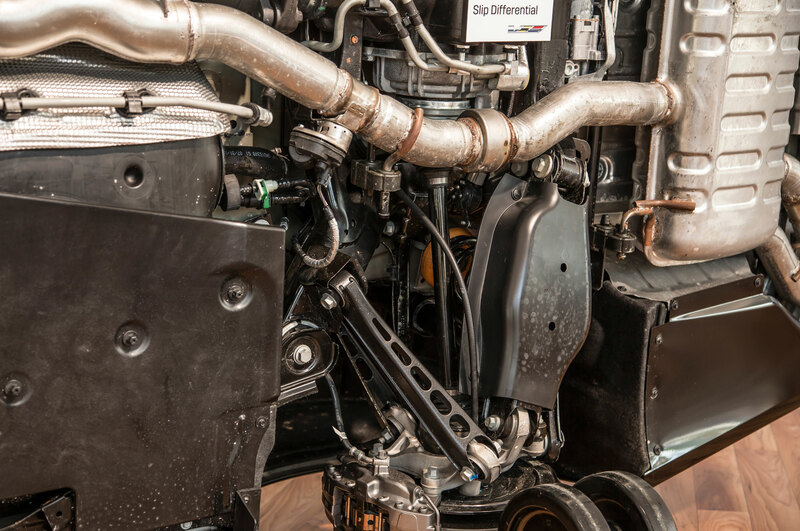 The CTS-V’s front suspension has a ride and handling link, and the cross-action joints replace inner bushings on the handling link to allow near-zero suspension compliance and improve steering and feel. 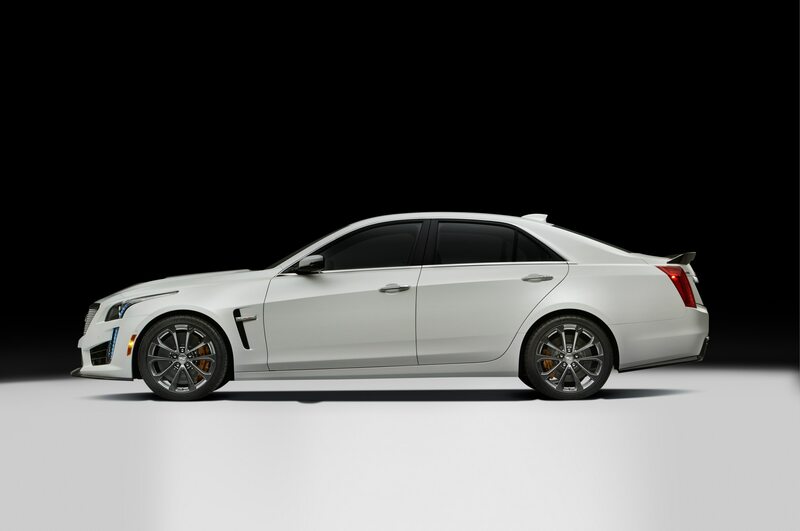 Hollow 27mm front and 26mm rear anti-sway bars replace the 25mm front/23mm rear bars of the CTS Vsport. 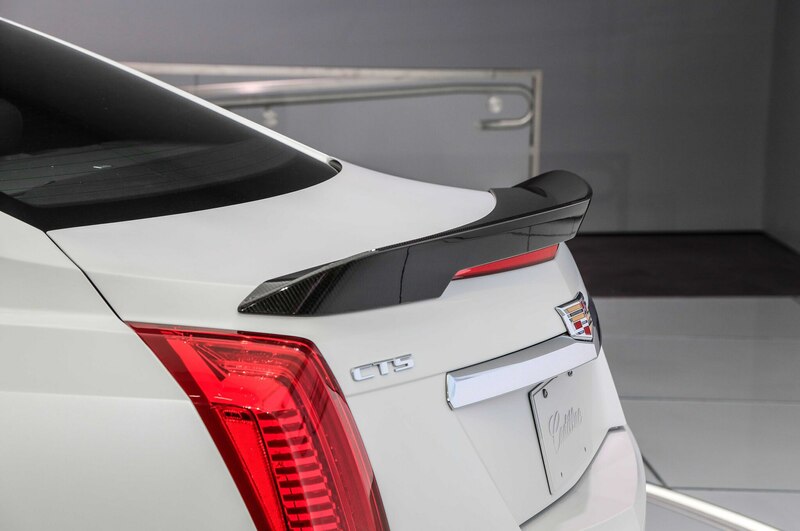 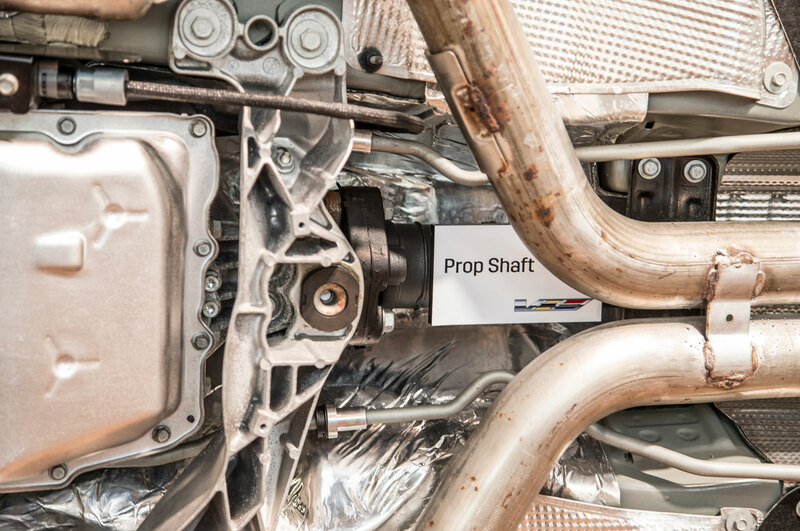 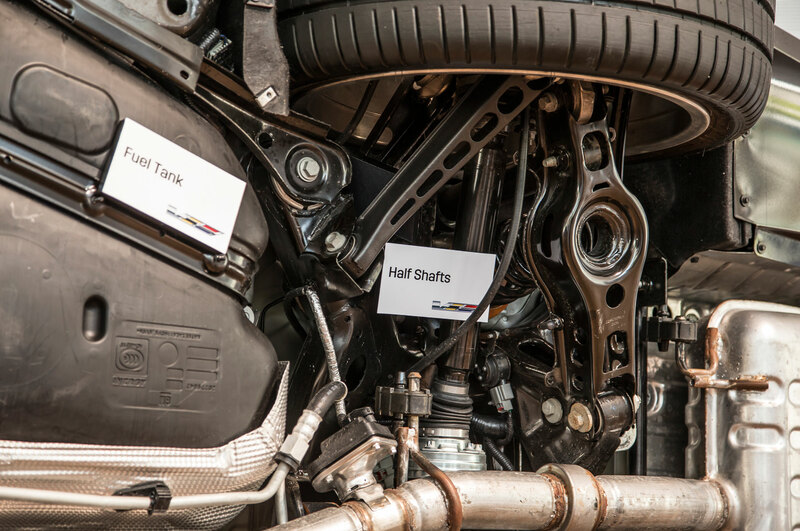 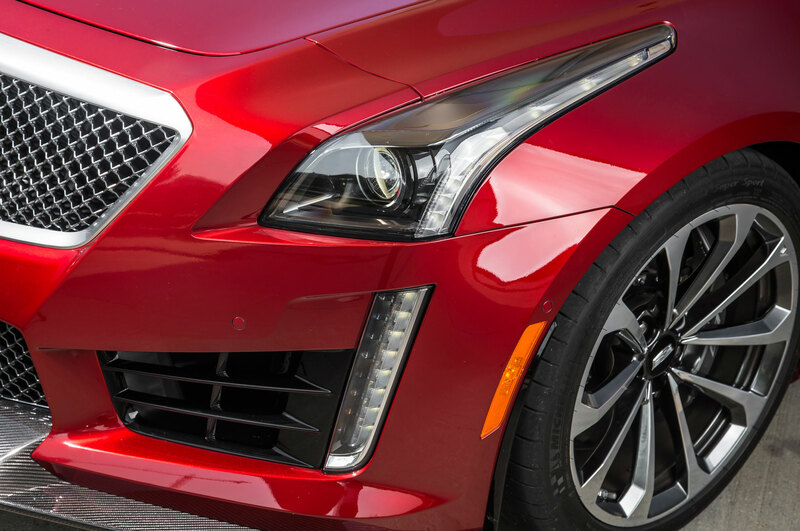 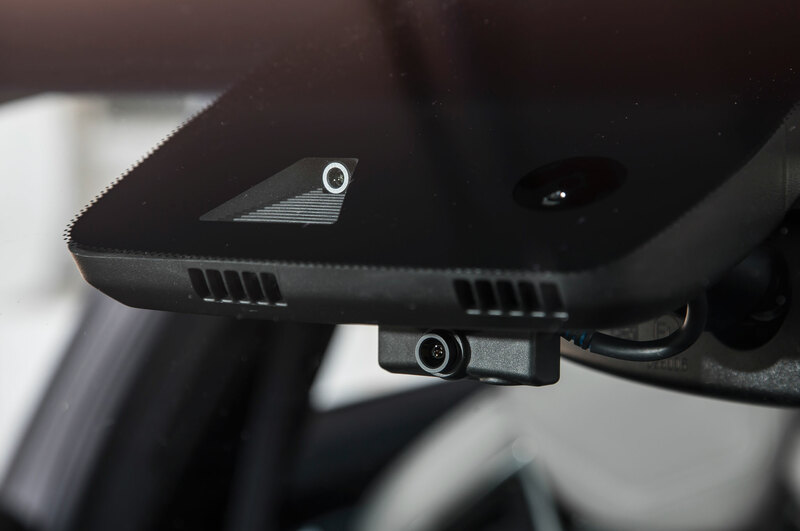 The 2016 Cadillac CTS-V also deploys a clamshell aluminum lower plate mounted to the bottom of the cradle designed to stiffen up the lower frame, improve steering precision and ride quality, and smooth out airflow under the car. 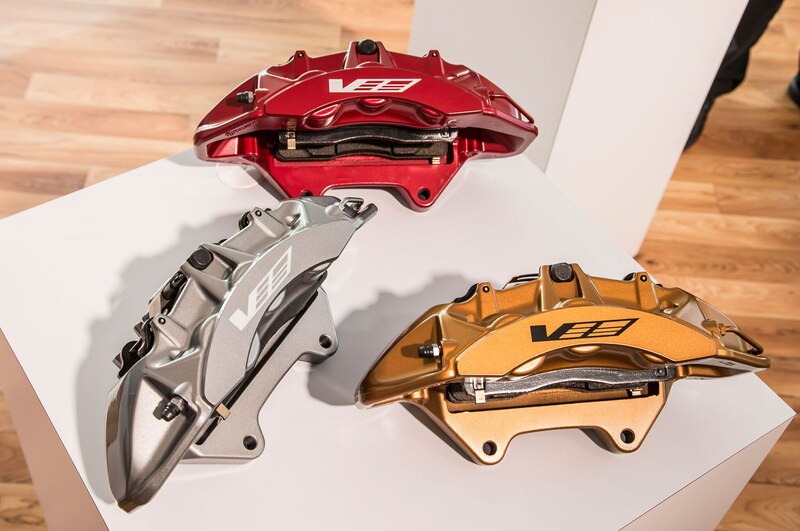 Standard Brembo brakes with GM’s FNC-coated calipers for longer wear have 15.4-inch rotors and a choice of three caliper colors. 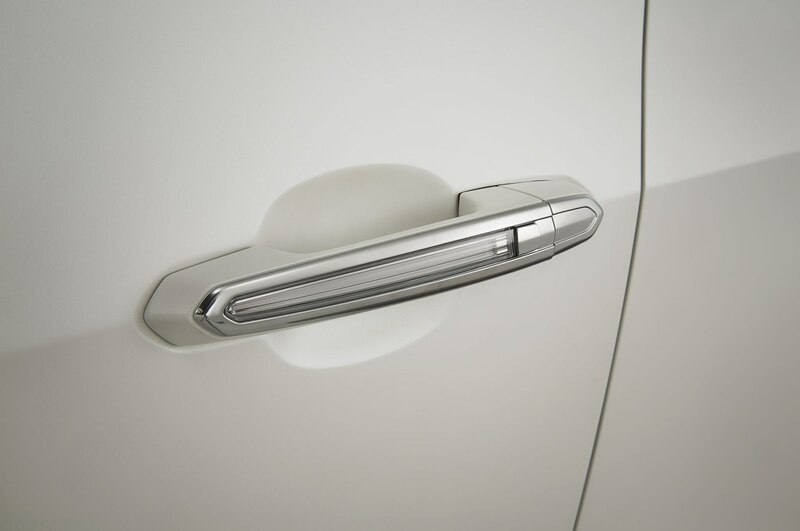 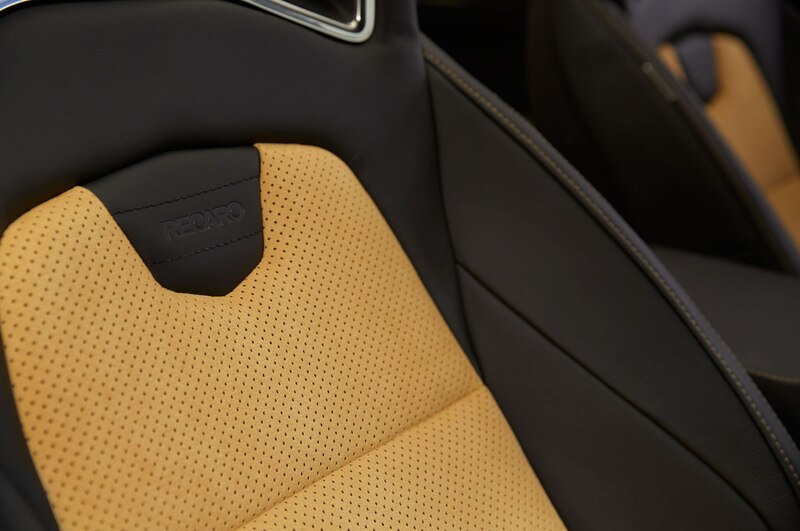 There are six exterior paint colors, plus a matte white “launch” paint, and three interior trims, including two-tone Recaro seat package options. 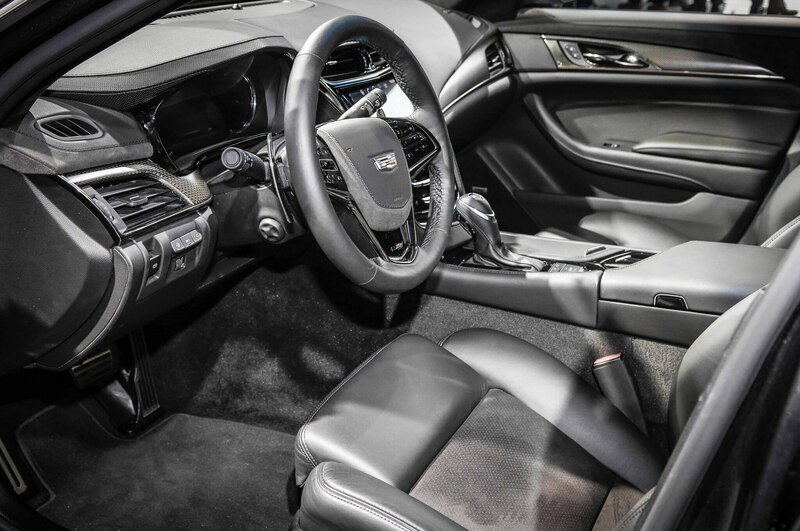 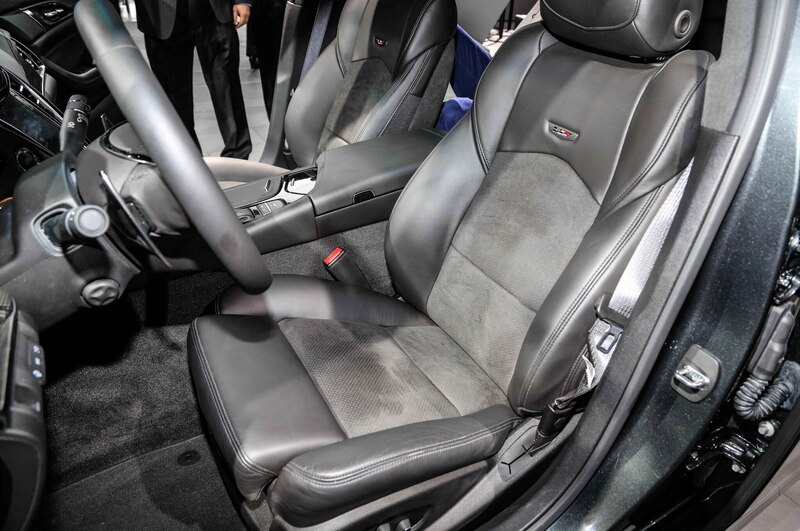 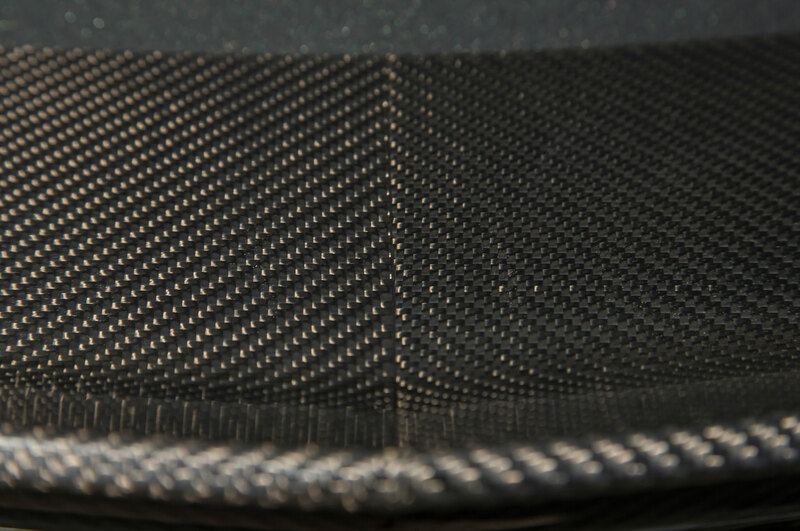 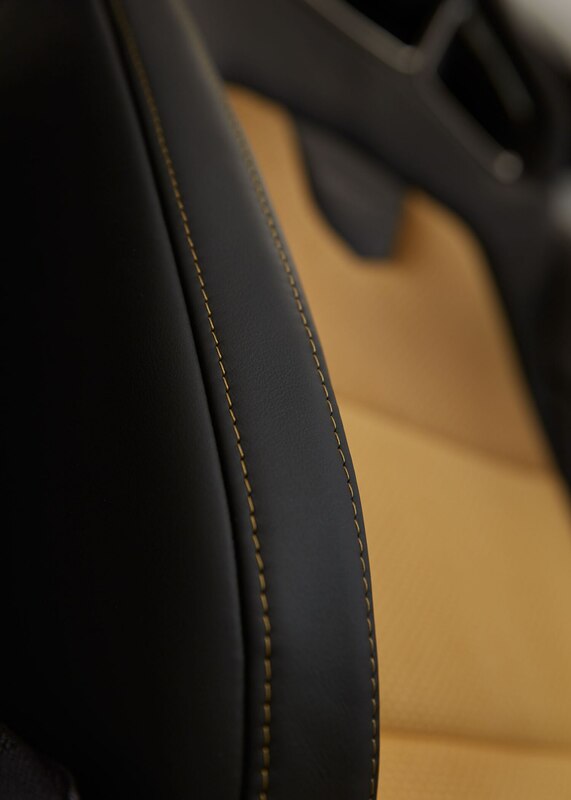 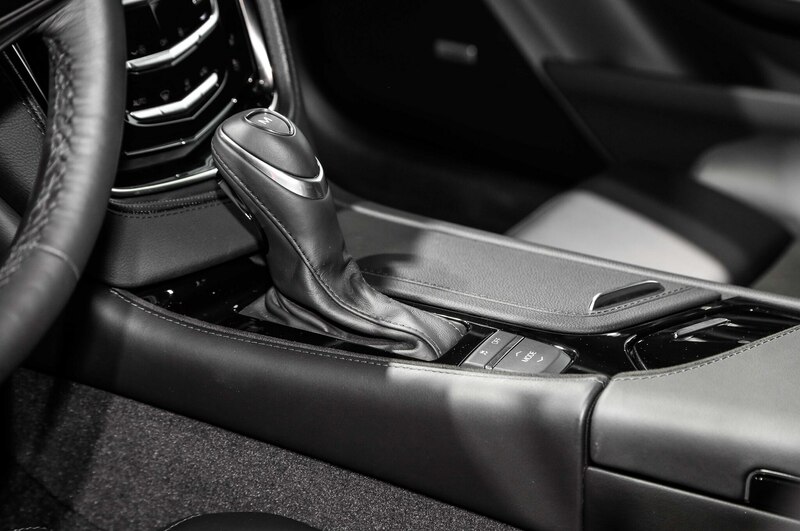 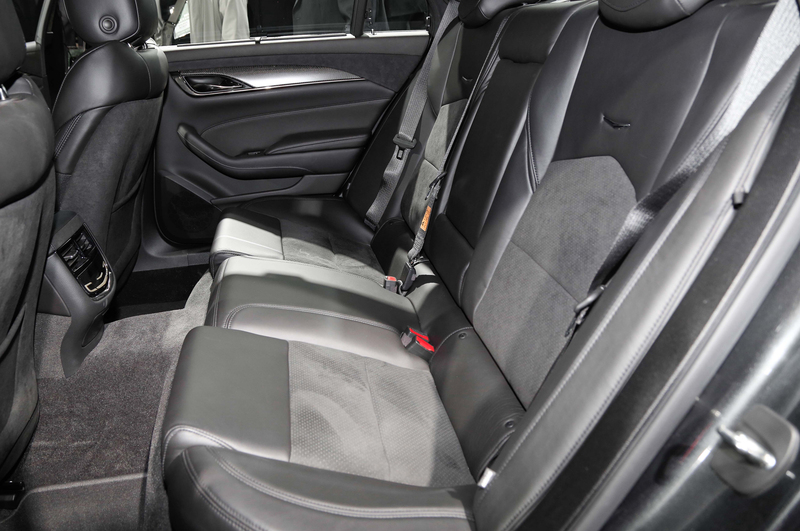 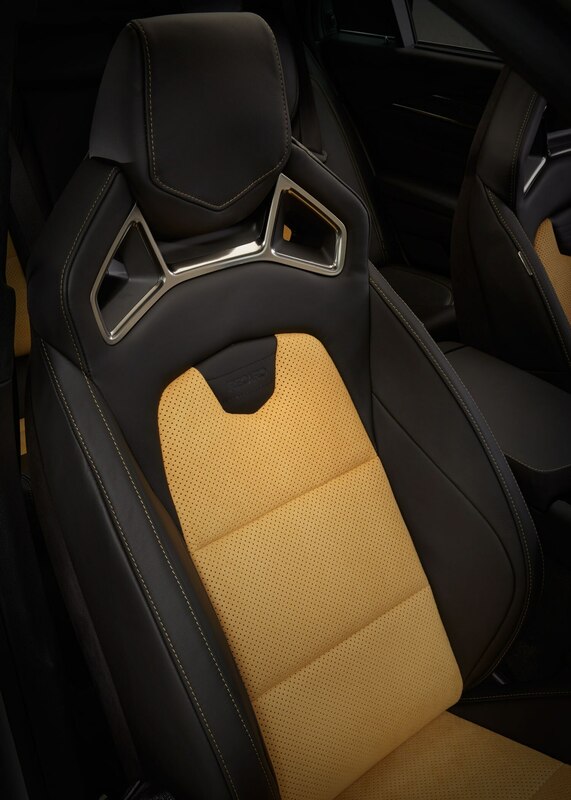 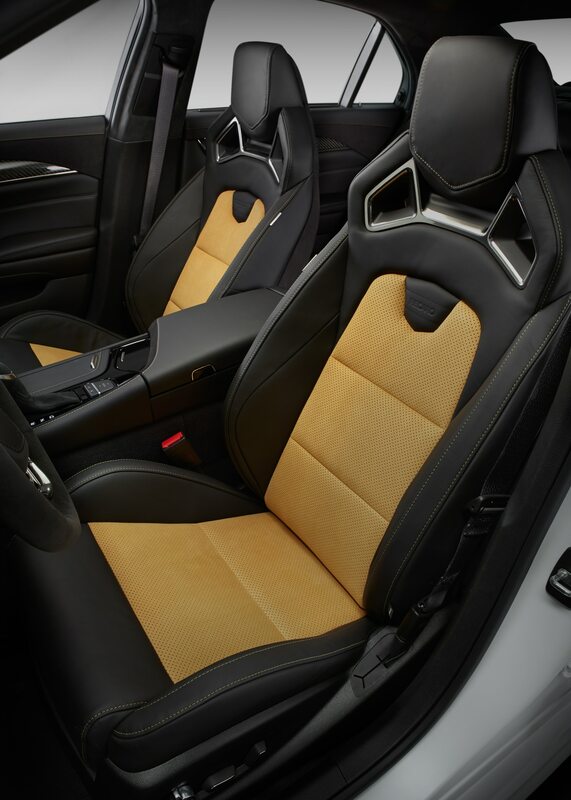 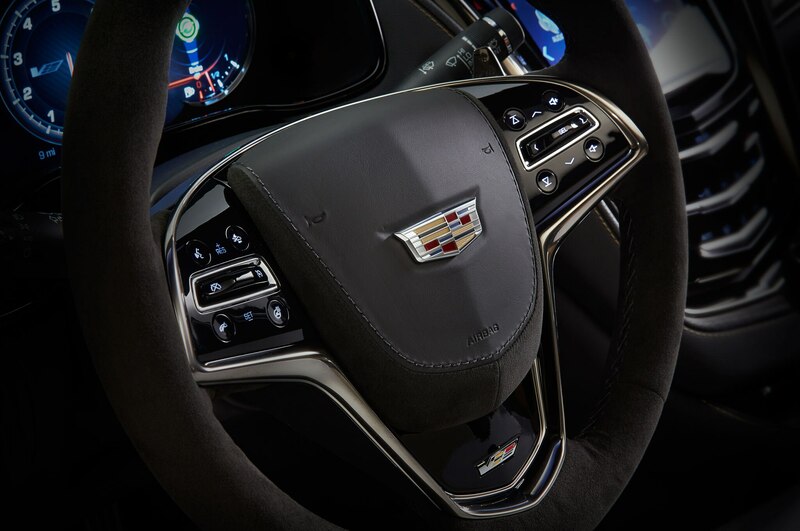 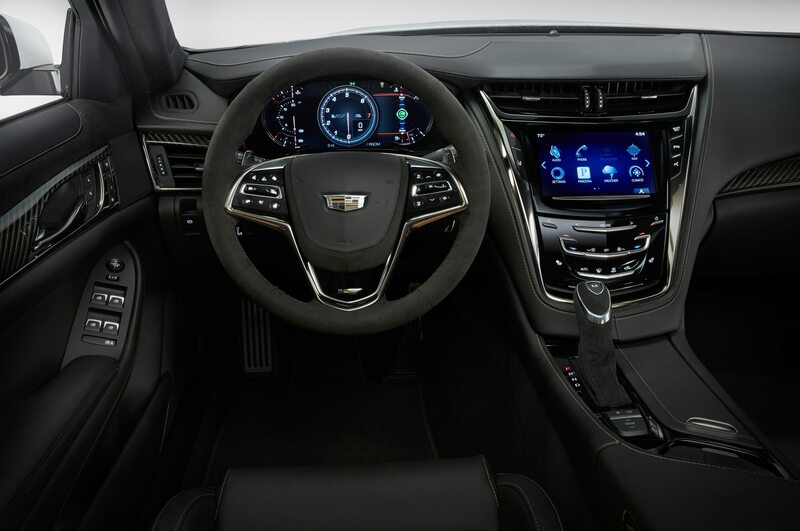 The interior features Cadillac’s “cut and sew” leather trim and synthetic suede at the “touch” points. 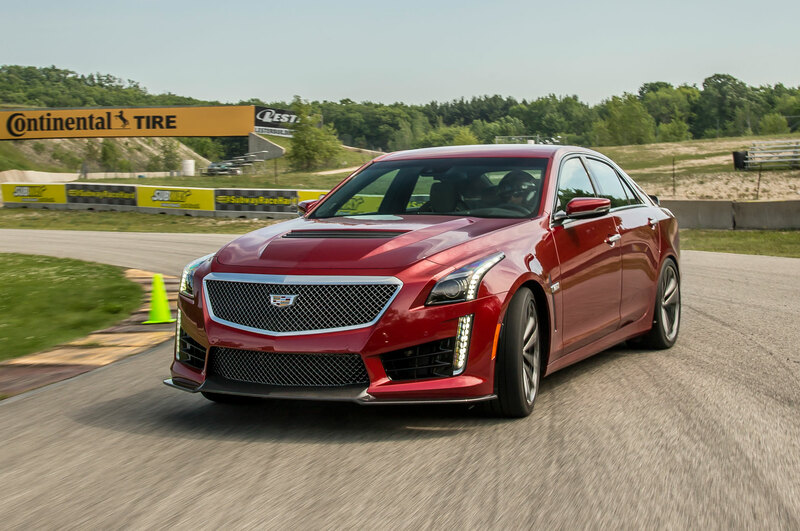 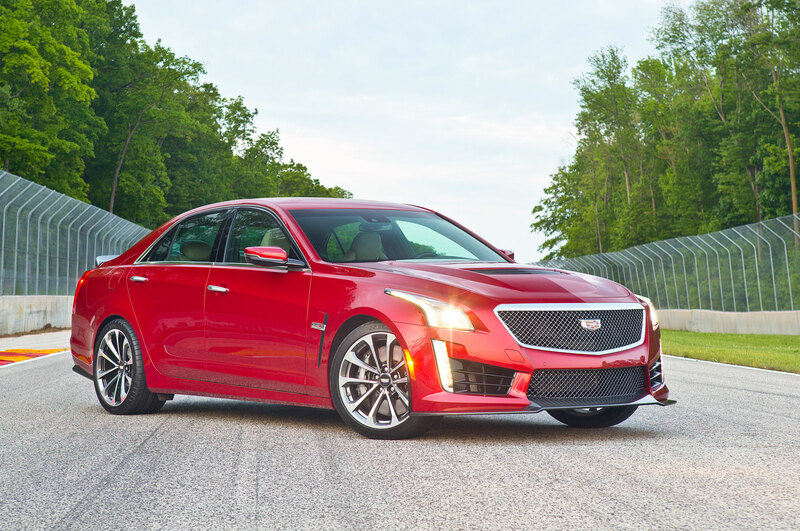 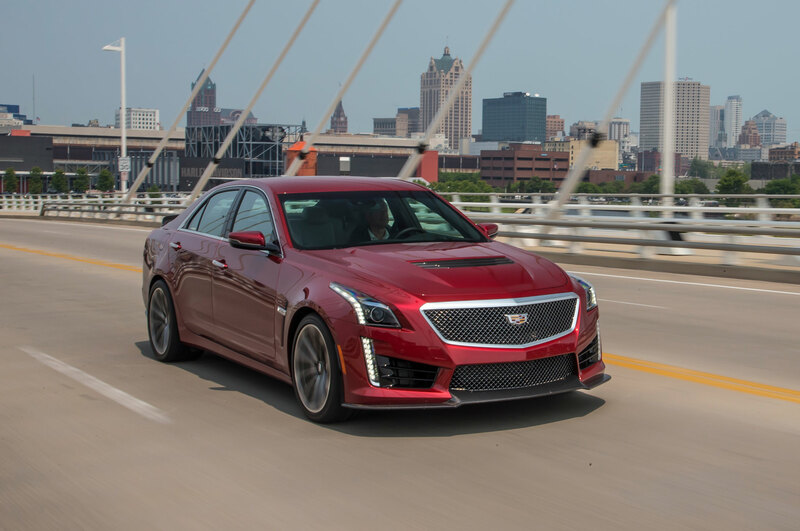 Add it all up and the 2016 Cadillac CTS-V, set to hit dealers by next fall, should be able to more than hold its own against the BMW M5 and Mercedes E63 AMG. 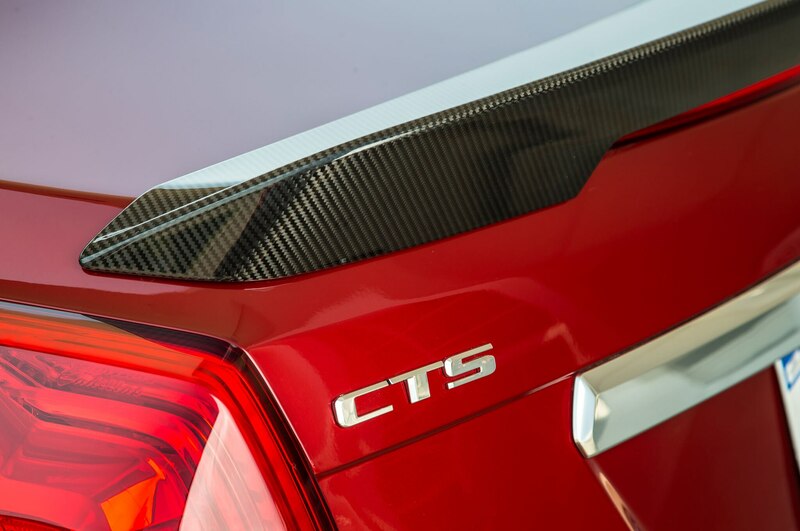 It’s a car that’s subtle and over the top in its luxury appointments at the same time. 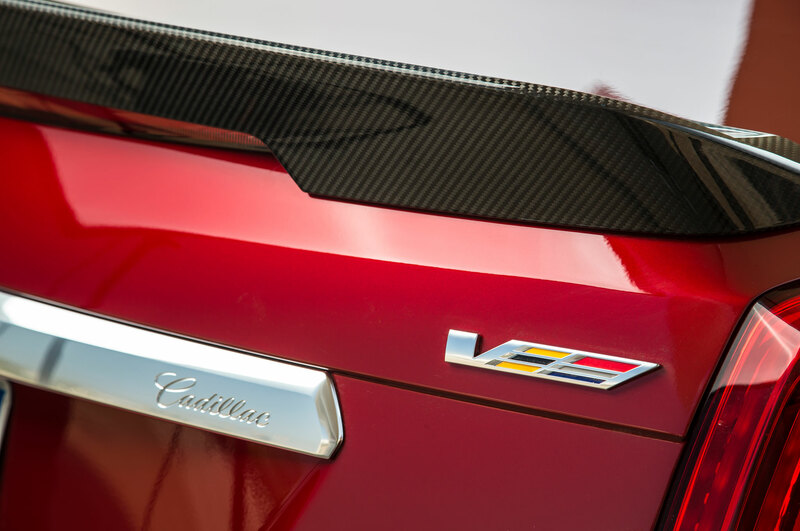 We’ll learn soon enough whether Cadillac also can pull off better-than-E63 straight-line performance combined with better-than-M5 ride and handling.